Small chassis, big performance? After products with 11 and 14-inches, the gaming experts from Alienware now offer a 13-inch product. Our article tries to focus on the question of whether a dual-core is sufficient for the GeForce GTX 860M and the external amplifier. 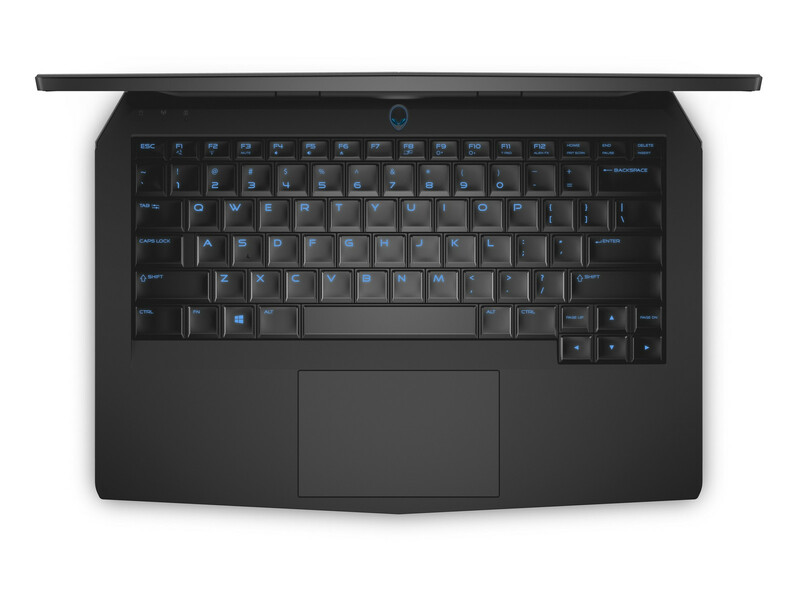 In addition to the Alienware 18 and Alienware 17, the parent group Dell now also offers a 13-inch notebook. This is a good development when you observe the advancements of recent years since the trend is obviously going towards light and compact cases. Dell already gained experiences with devices smaller than 15-inches. Besides the Alienware M11x, the Alienware 14 was an interesting product as well. 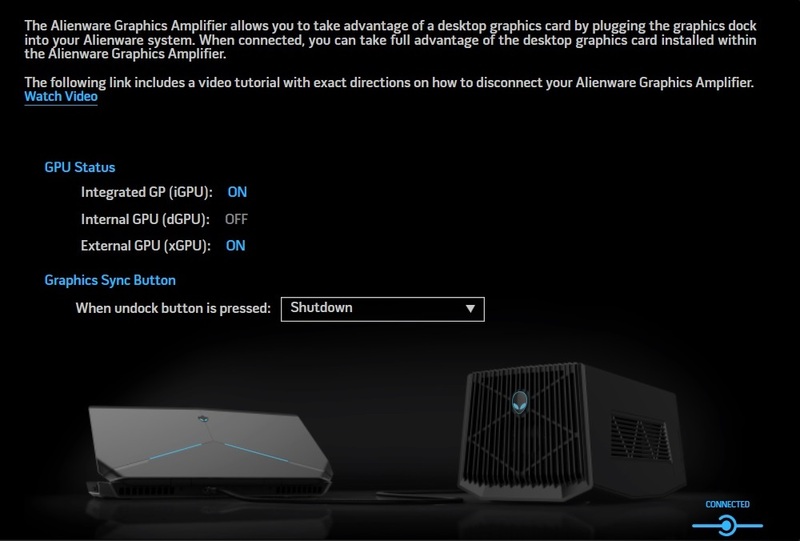 The Alienware 13 is basically the middle course. The homepage of the manufacturer currently lists three configurations. While the cheapest version uses an HD panel (1,049 Euros, ~$1269), our version for 1,149 Euros (~$1390) has a Full HD display (1920x1080 IPS instead of 1366x768 TN). If you prefer extremely sharp screens you might want to get the QHD option, even though 2560x1440 pixels might be a bit too much for this display size. Then there are also the increased performance requirements (Windows 8.1 is not perfect for such high resolutions, either). The other specifications are identical. Every version comes with 8 GB DDR3 RAM (16 GB for 140 Euros extra, ~$169), a 1,000 GB hard drive (SSD for 149-329 Euros, ~$180-$398) as well as a GeForce GTX 860M. The processor can currently not be upgraded. The Core i5-4210U is a pretty risky decision by Dell since the CPU only has two cores with a comparatively low clock. The most interesting option is probably the Graphics Amplifier for 249 Euros (~$301). The external box can accommodate desktop GPUs from AMD and Nvidia. 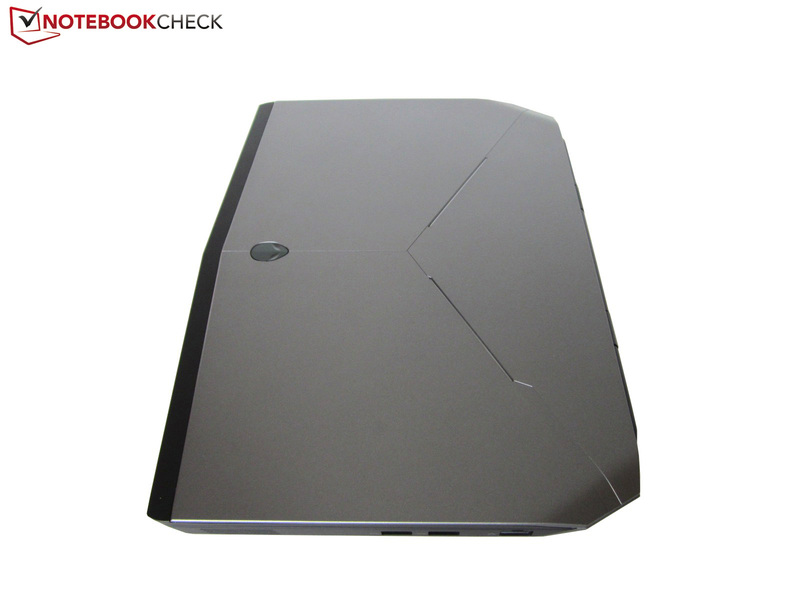 As is expected from an Alienware device, the chassis design is pretty appealing. The futuristic look follows the design language of the bigger siblings. 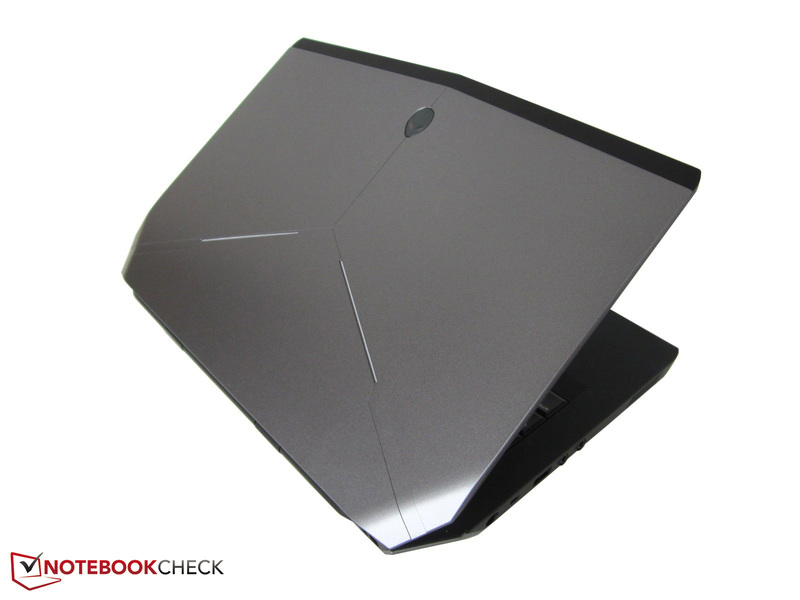 The Alienware 13 is pretty light for a gaming device with almost two kilograms. A height of 2.8 centimeters is decent as well, so it shouldn't be a problem to transport the high-end dwarf. The competing W230SS Barebone from Clevo, which is also equipped with a GeForce GTX 860M, is both slightly thicker and heavier. Otherwise, there are hardly any alternatives with 13-inches. The choice is bigger in the 14-inch segment, for example, the Gigabyte P34G v2 (Core i7-4710HQ & GeForce GTX 860M @1,400 Euros, ~$1693) and the MSI GE40 (Core i7-4712MQ & GeForce GTX 850M @1,150 Euros, ~$1391) that weigh 1.8-1.9 kilograms and have a height between 21 and 30 millimeters. The quality of the Alienware 13 is very good. Besides the visual design, the build quality surpasses other gaming notebooks as well. According to Dell, the cover is made of a material that is popular in aircraft construction (carbon fiber reinforced plastic) and significantly lighter than conventional metal. It is a matter of taste if you like the rubberized area around the keyboard, but it tends to attract fingerprints when you have greasy fingers. 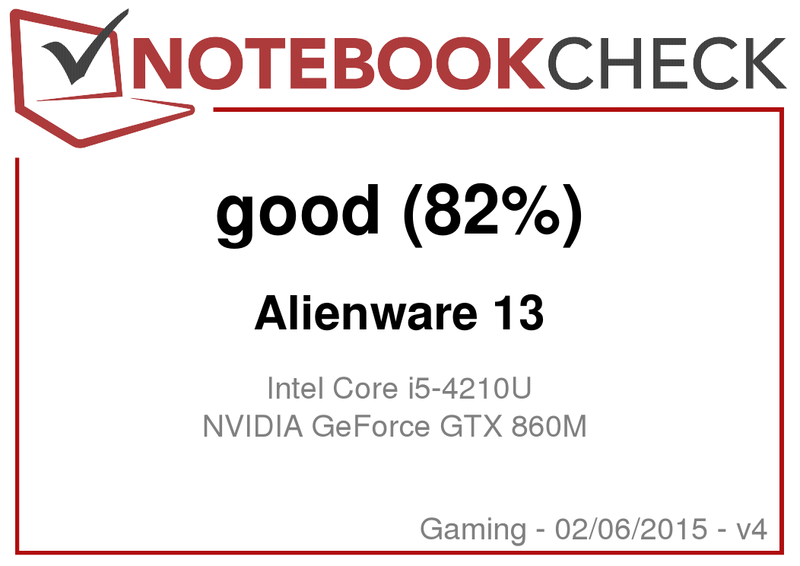 The stability of the Alienware 13 is on a good level. 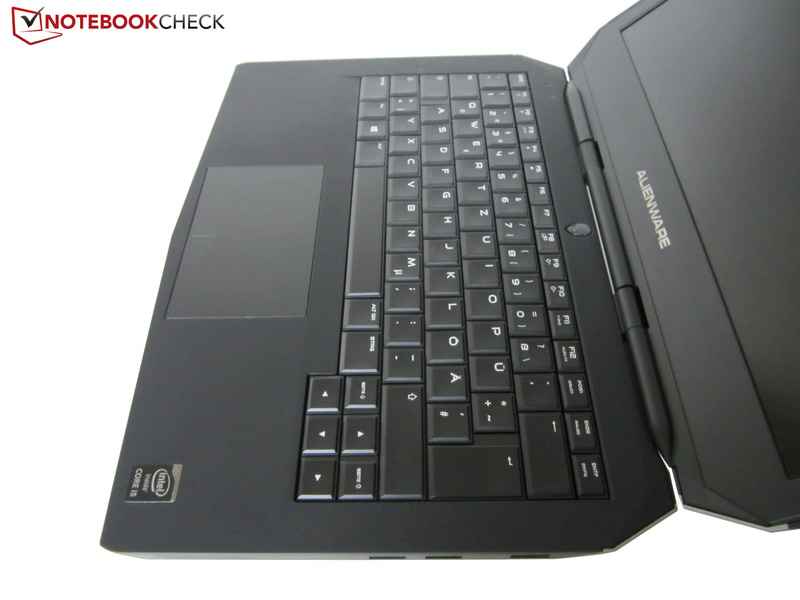 The display cover can be – similar to the majority of notebooks – twisted quite a lot, but the base unit is very sturdy. Only the keyboard could have benefited from a higher resistance. The firm hinges keep the display well in position, but you will need two hands to open the lid. The port variety reminds us of the W230SS Barebone (RJ-45, 2x sound, HDMI), whereas Dell only integrates three instead of four USB ports. Another difference concerns the display ports. 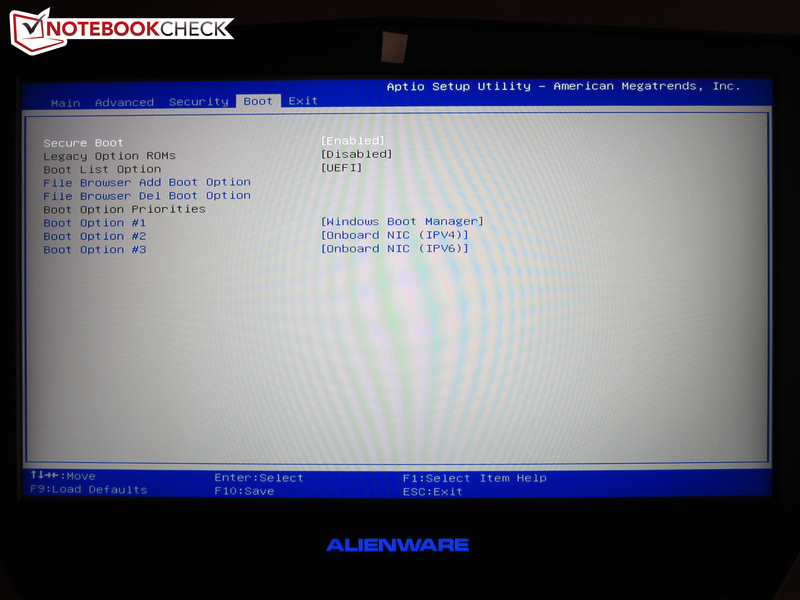 The Alienware 13 does not have a VGA output but a DisplayPort. 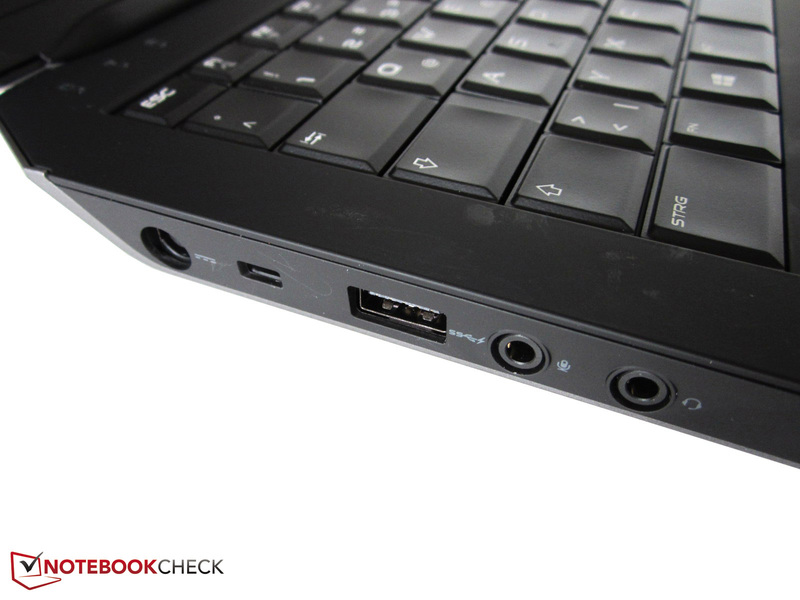 All ports are located at the rear half of the notebook, so both left and right-handers should have no problems using a mouse. Thanks to the fan location at the back, you are not confronted with the warm air, either. You can obviously use the wireless Internet connection if you don't have an Ethernet cable or prefer the wireless solution. The Killer-1525 module from Qualcomm Atheros is supposed to be – similar to the network card Killer e2200 (Gigabit Ethernet) – well suited for gaming. 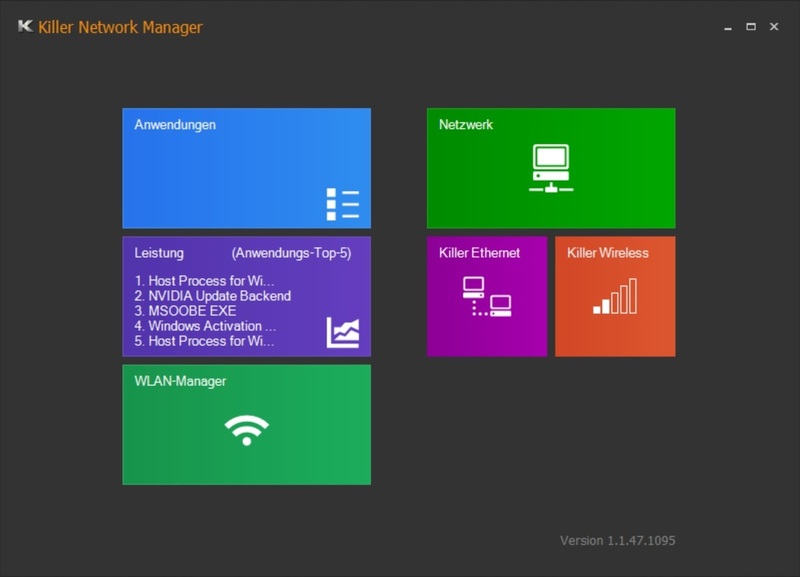 Besides the usual WLAN standards 802.11 a/b/g/n, the wireless adaptor also supports Bluetooth 4.0. Another highlight is the support for the latest ac-technology. The range test (scenario varies from author to author) showed a good performance for the Alienware 13. We still got three bars, even with a distance of 10-15 meters and through several walls. The maintainability leaves mixed impressions. The number of screws suggests that you can remove the whole bottom cover, but the mechanism is not really comprehensible (how and where can you separate the surfaces? ), so we stopped our attempt to avoid any damage. The "normal" maintenance cover only reveals the storage solution (1x 2.5-inch or 1x M.2) as well as the two memory slots. The software equipment is really comprehensive. 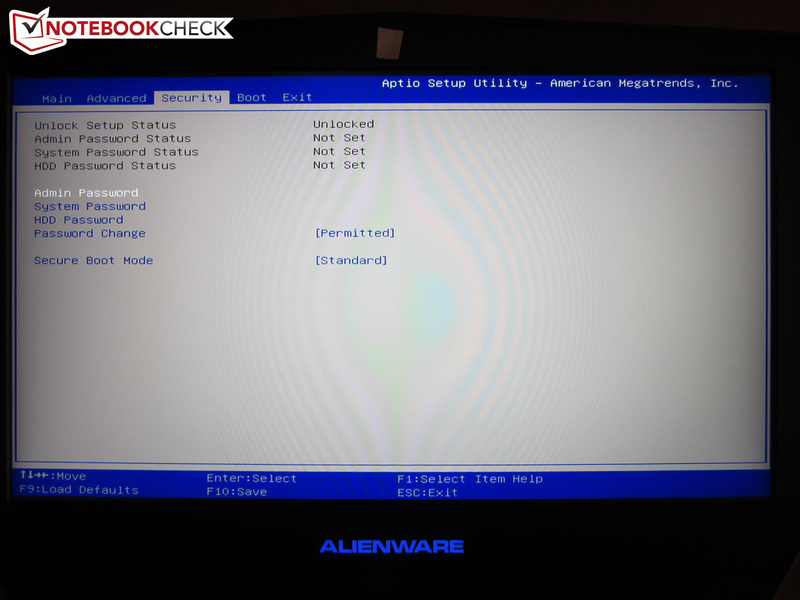 It includes, for instance, AlienAutopsy (system monitoring) or AlienBackup (recovery management). 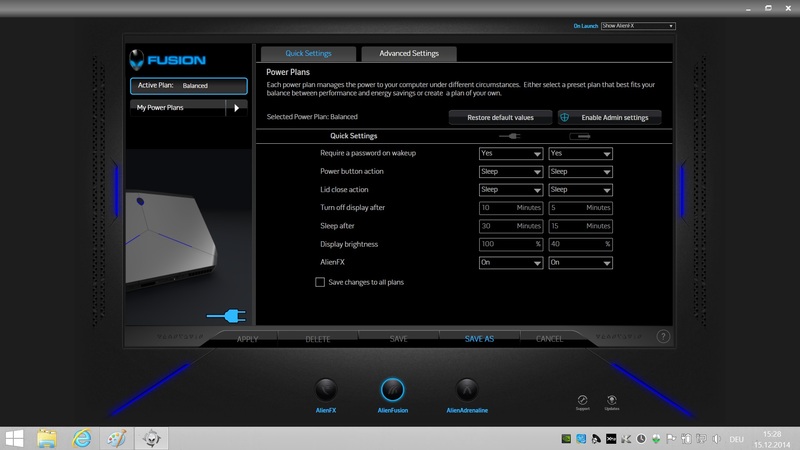 Contact point #1 is the Command Center, where you can adjust the chassis illumination (AlienFX with 20 colors) and adjust the energy-saving modes (AlienFusion), and also check the status of the Graphics Amplifier (AlienAdrenaline). Thanks to the keyboard with four zones and other illumination elements, the notebook looks pretty nice from a distance and almost screams gaming. The scope of supply is pretty limited. 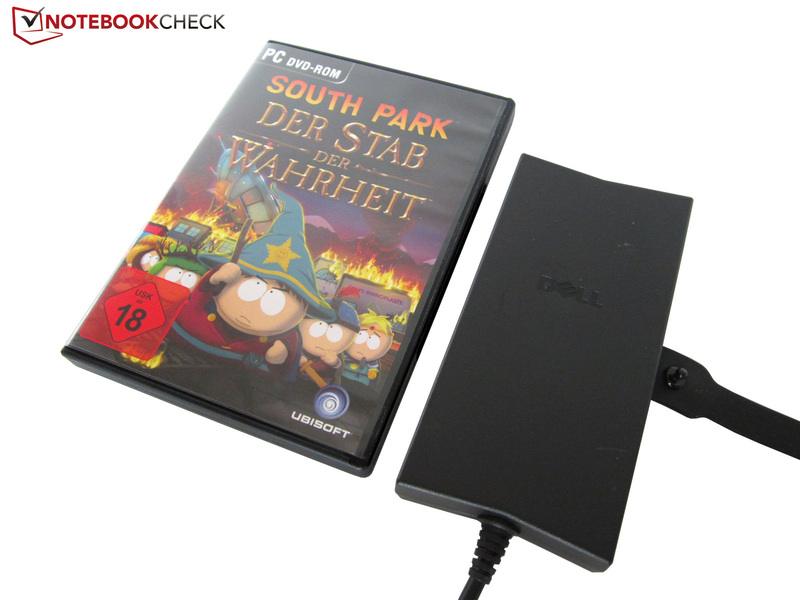 The power adaptor (15.2 x 7.5 x 2.5 centimeters) with a weight of 520 grams is only accompanied by a quick-start guide and some safety information. But there is one more "goodie" in the box. We think it is a great idea to deliver the system recovery on an 8 GB USB stick and other manufacturers should take this as an example. The standard warranty period is one year. For an additional price, you can get an extension to 24, 36 or 48 months. In addition, the manufacturer offers a twelve-month accidental and theft protection. Except for the stability, there is not much criticism for the keyboard. Yes, a combined Ins/Del key is not perfect and not every user wants to waive a numeric keypad. But all in all, the keyboard has more advantages than issues. Besides the intense and even illumination, we also like the convenient typing experience. Inputs are neither loud nor clattery. A key size of 13 x 13 millimeters is also decent, even though the F-row is slightly smaller, which is pretty common. Dell does not risk anything with an experimental layout like MSI (GS60, GS70, etc. ), so you should get used to the input pretty quickly. Some gamers might like the separated arrow keys as well. 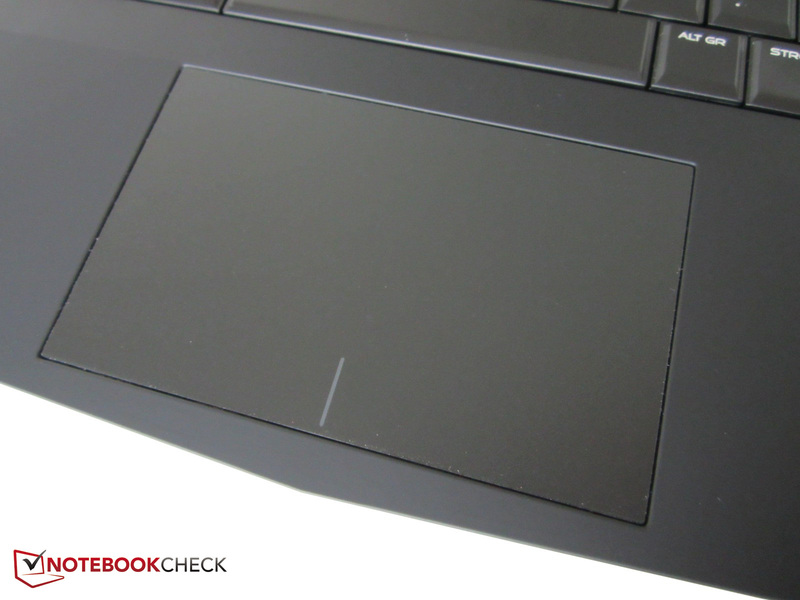 The touchpad, or more precisely the ClickPad, could not really convince us. The mouse replacement has a very generous size (107 x 67 millimeters), but the structured surface does feel a bit unpleasant after a while. The goal of the rough surface is a better feedback. You can instantly feel the transition to the palm rest, so the minimal depression is completely sufficient. 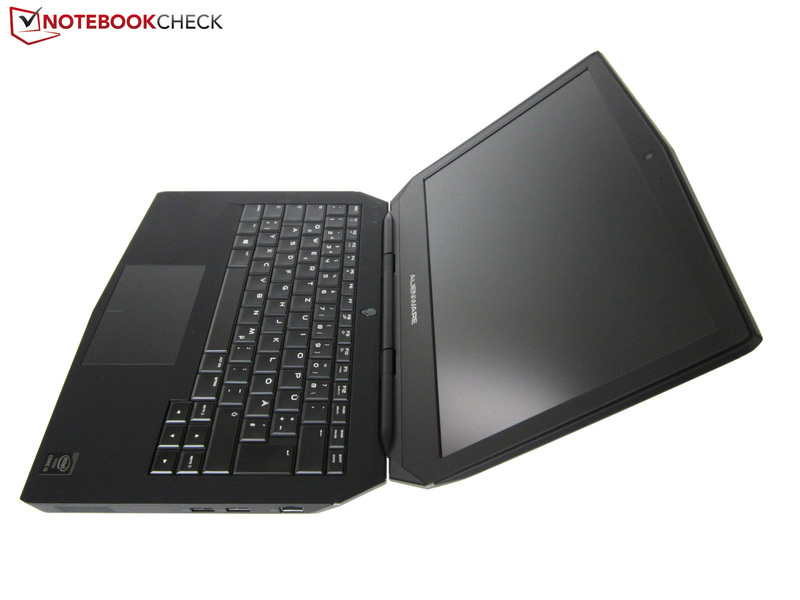 The mechanics of a ClickPad are a matter of taste. Because of the missing dedicated buttons, some inputs are faster or more comfortable, respectively, but the precision of many ClickPads cannot keep up with normal touchpads. Another problem: The cursor tends to jump during some inputs or clicks are not recognized accurately. The multi-touch gesture support was not perfect, either, scrolling worked well but the zoom function was a bit lazy during the review. 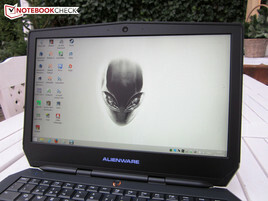 We already mentioned that the medium-priced version of the Alienware 13 is equipped with a Full HD display. 1920x1080 pixels is the perfect resolution for this size. You have to decide for yourself whether 13-inches is sufficient for gaming or not. People that are further away (ego-shooter, sport titles, etc.) appear bigger compared to the Alienware M11x, but your eyes should be pretty good in capturing all the details nonetheless. More enthusiastic gamers will likely prefer devices with 15 or 17-inches. 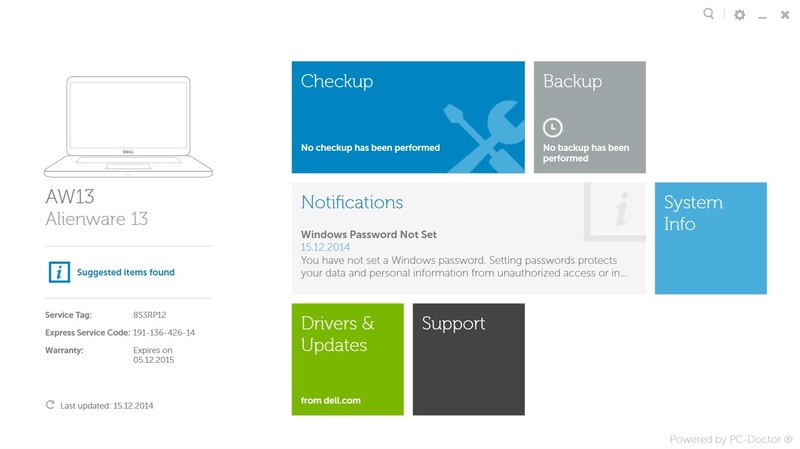 Dell deserves praise for the integrated panel (9T7WM_11HL), which can convince with its IPS technology. IPS is usually a synonym for wide viewing angles and a crisp and colorful picture. 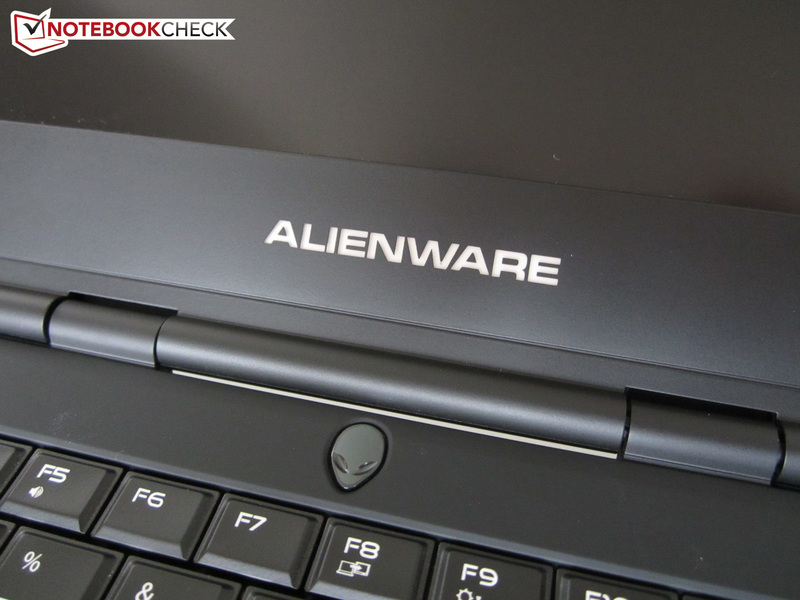 The Alienware 13 is no exception. If you ignore the grayscale and the RGB balance (red colors are a bit too pale), then the picture is very natural. The rich picture is also a result of the high contrast ratio: Almost 1000:1 is only surpassed by a couple of notebooks. 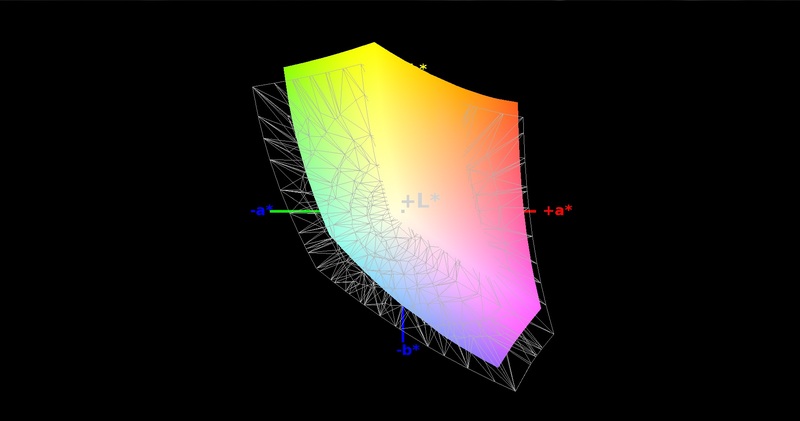 A black value of 0.32 cd/m² and a luminance of around 300 cd/m² also meet expectations. The result for the brightness distribution (83%), however, is just average on paper. Subjectively, there is no annoying screen bleeding. 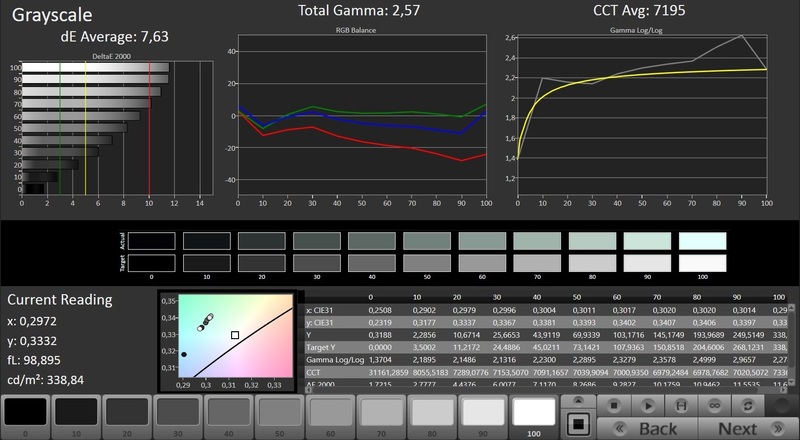 Our test software determined color-space coverage of 77% sRGB and 57% AdobeRGB – decent results. The use outdoors is no problem thanks to the matte surface; you can still recognize the display content even under direct sunlight. 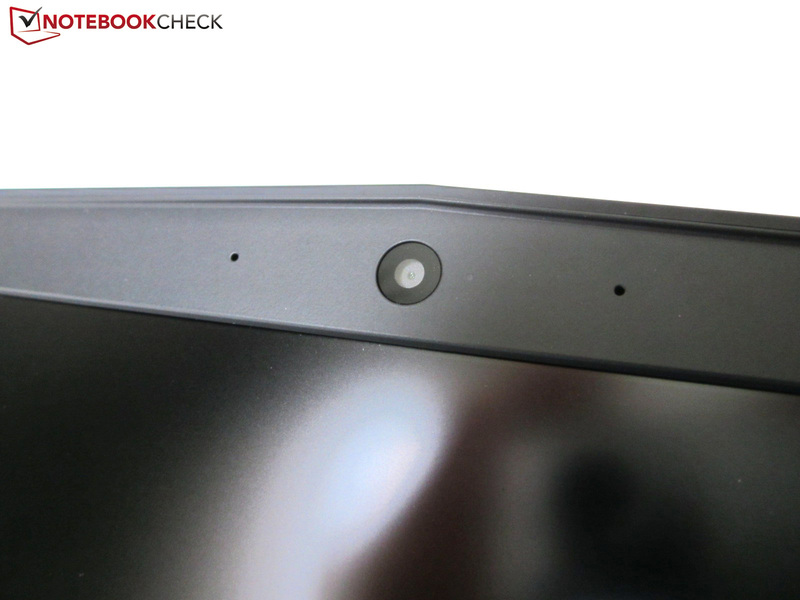 Typical for the IPS technology is the high viewing-angle stability of the 13-inch panel. Even good TN panels usually have issues with horizontal and vertical shifts. Picture distortions are only a problem from an angle above. Compared to the QHD+ panel of the Clevo W230SS, the Full HD screen has a higher contrast (997 vs. 685:1), but it is not as bright (295 vs. 339 cd/m²). 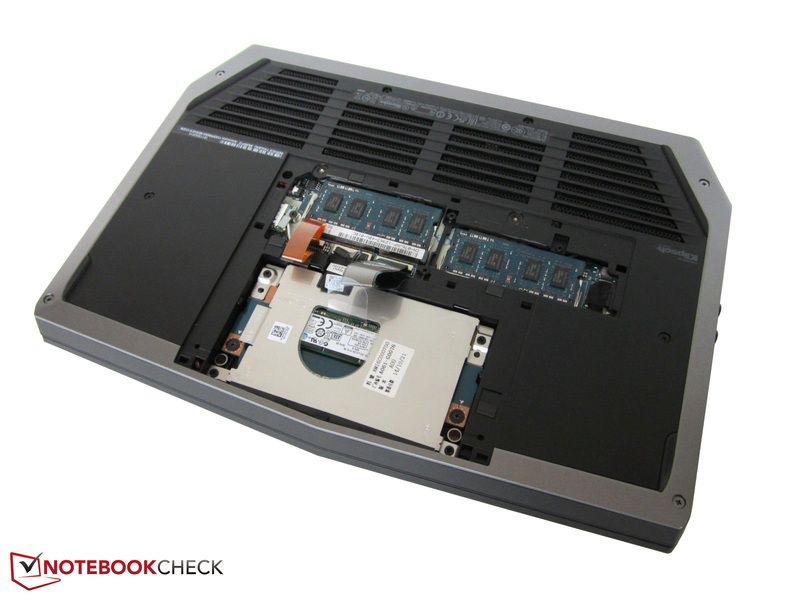 Contrary to the majority of high-end notebooks, Alienware does not use a 47 Watts CPU but a model with a TDP of 15 Watts. Similar to its bigger siblings, the Core i5-4210U is based on the Haswell architecture (22 nm) and runs with 1.7-2.7 GHz under load. 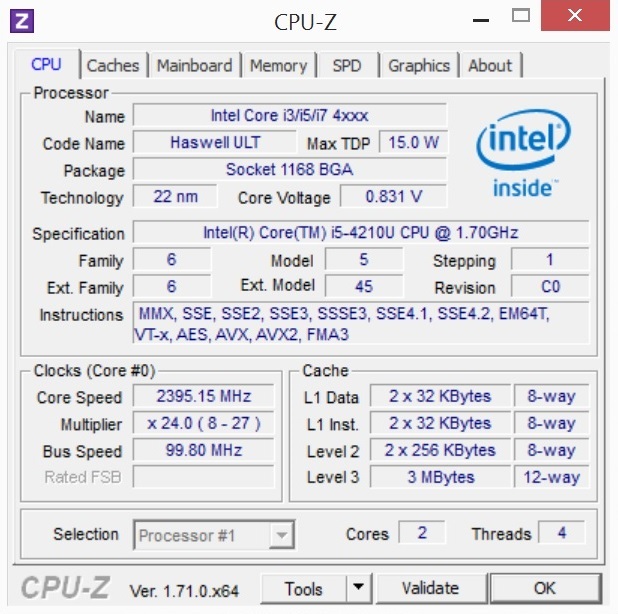 For comparison: The Core i7-4710HQ, which is used in a lot of gaming notebooks, runs with 2.5-3.5 GHz. Intel tries to compensate for the low number of cores with Hyper-Threading technology. Thanks to the simulation of two virtual cores, the processor can execute up to four threads simultaneously. Still, the performance cannot compete with a "real" quad-core. 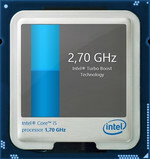 Intel's quad-core models manage eight threads simultaneously and have a significantly higher clock. 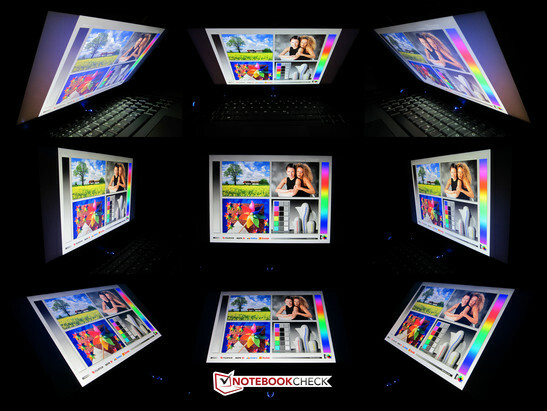 Graphics are handled by the HD Graphics 4400 of the Core i5-4210U, which has a core frequency of 200-1,000 MHz. 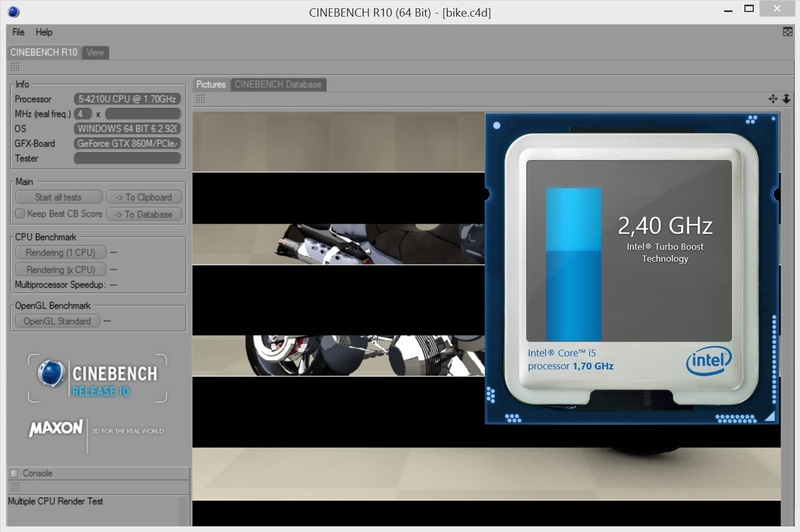 Dell implements switchable graphics to reduce the power consumption and improve the battery runtimes. Nvidia's Optimus technology is pretty common nowadays. 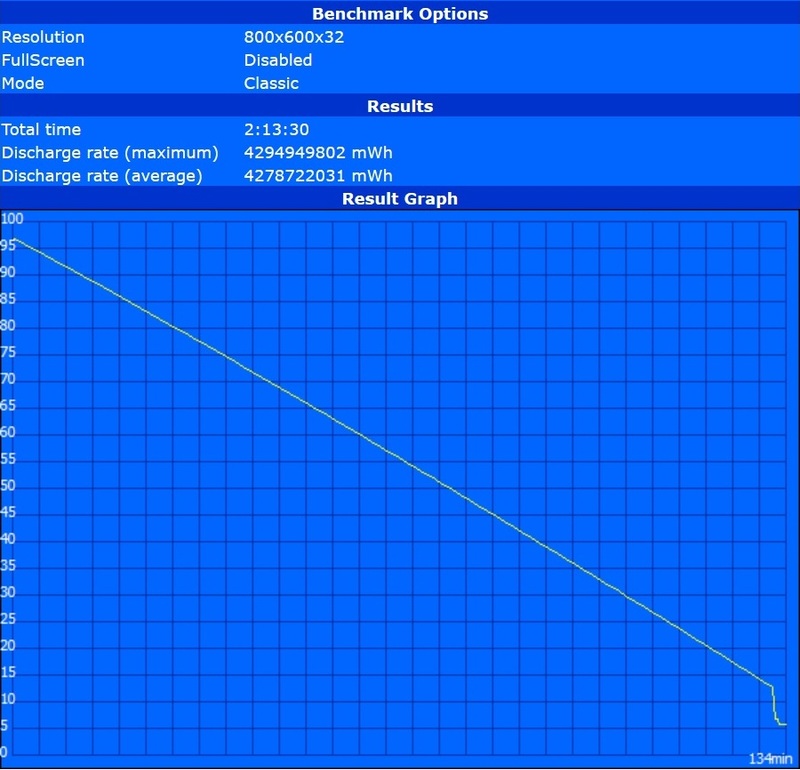 The Turbo utilization of the frugal CPU is pretty good in the Alienware 13. 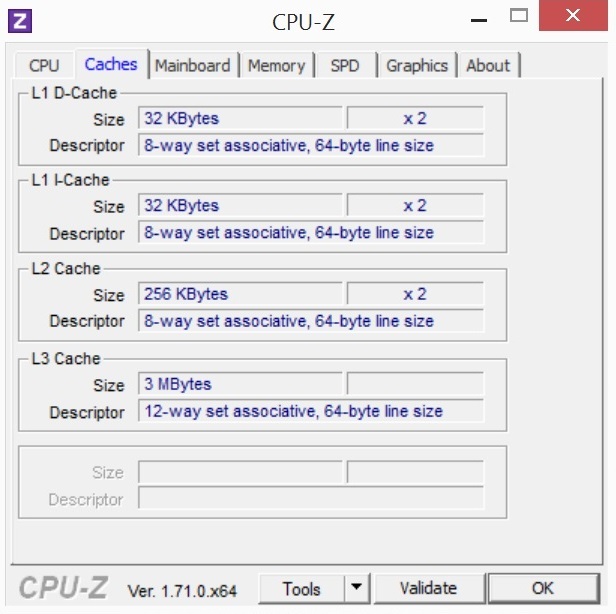 2.4-2.7 GHz with single-core load and 2.4 GHz with multi-core load are easily sufficient for standard tasks (videos etc. ), but our benchmarks show that the clock should be higher for modern games. At least we couldn't determine any throttling even under maximum load. 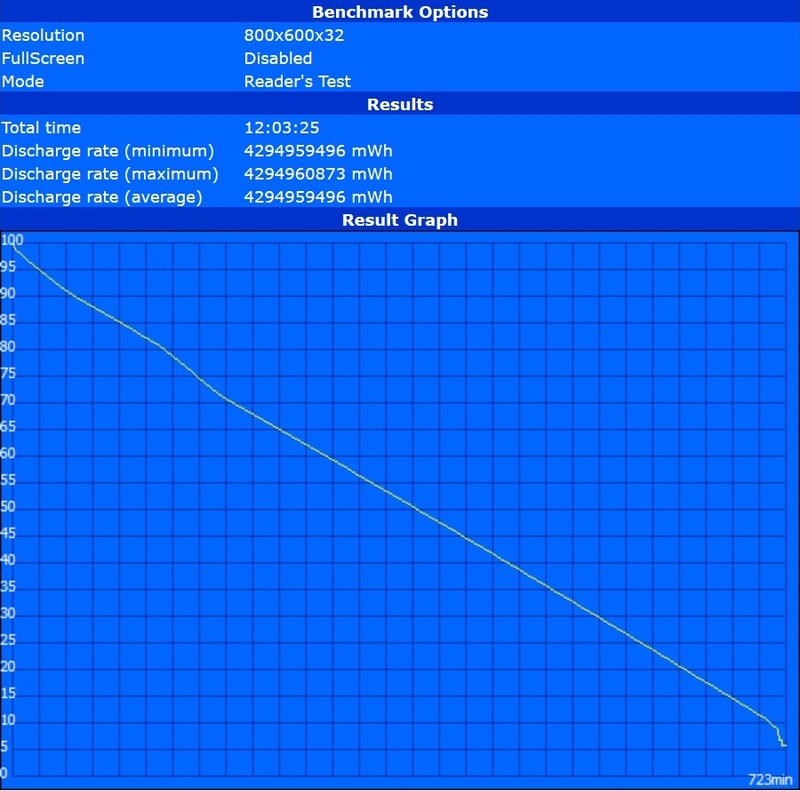 The Core i5-4210U still ran with 1.9-2.0 GHz even after our stress test for 60 minutes (FurMark + Prime95). Because of the mediocre clocks, the 15 Watts CPU is far behind the 47 Watts rivals. While the Core i5-4210U "only" has a deficit of 25% compared to a Core i7-4710HQ (Acer V 15 Nitro) in the single-core rendering test, the CPU falls behind by 64% in multi-core scenarios. 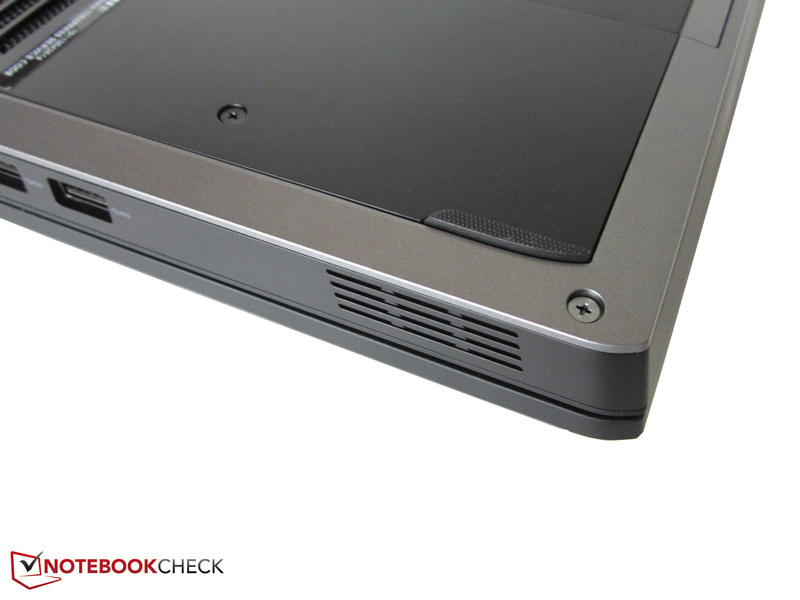 The Clevo W230SS Barebone shows that you can actually equip a 13-inch chassis with a quad-core processor. The biggest advantage of the 15 Watts model is the moderate power consumption. A standard quad-core would probably increase the temperatures as well as the noise. The GeForce GTX 860M was the only high-end GPU based on the Maxwell architecture before Nvidia launched the new top versions GTX 980M and GTX 970M. The Maxwell architecture is not only faster but also more efficient than the Kepler architecture. 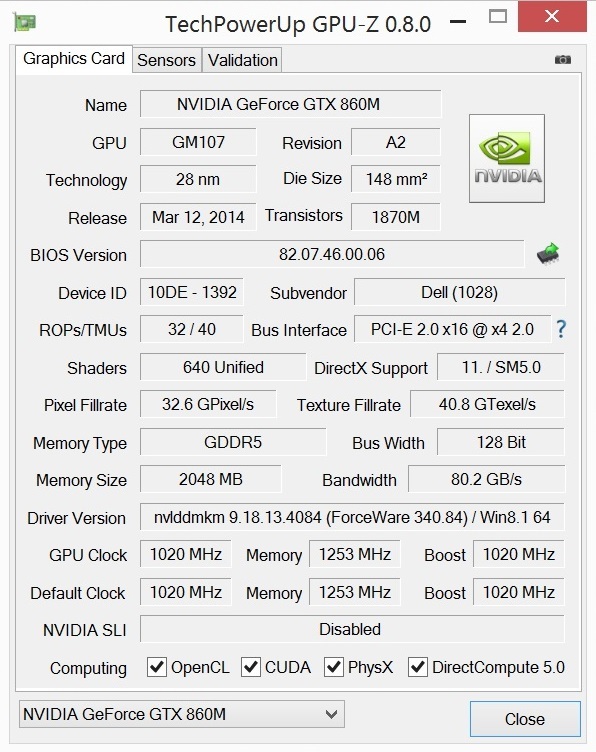 Despite the lower number of shaders (640 vs. 768), the 860M is much faster than its predecessor, the GeForce GTX 765M. 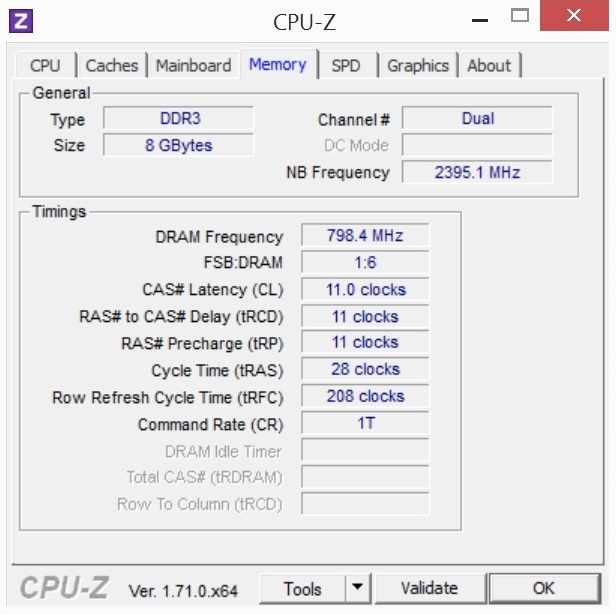 One reason is the higher clocks: Instead of 850-902 MHz, the Maxwell version of the GTX 860M runs with 1,029-1,097 MHz. Memory type and interface haven't been changed: The DirectX-11 chip has 2,048 MB GDDR5 video memory and a 128-bit memory interface. The GPU currently has no chance against the high-end chips. Both the GTX 970M and the GTX 980M are noticeably faster with 1,280 and 1,536 CUDA cores, respectively. There are rumors that Nvidia will launch the successor of the GTX 860M at the beginning of 2015 and therefore close the performance gap. Note: A small number of notebooks are equipped with the GTX 860M version based on the Kepler architecture (Clevo P150SM-A, Aorus X7 v2). That the 15 Watts CPU has a negative impact on the performance is not least apparent when you look at the GPU benchmarks. The best example is the 3DMark 13 Fire Strike test. While the GPU score of 3,822 points is still comparable to other notebooks with the GTX 860M like the Acer V 15 Nitro, the Physics score is almost 60% behind the rivals. This is, however, not surprising since they all use a powerful quad-core processor. 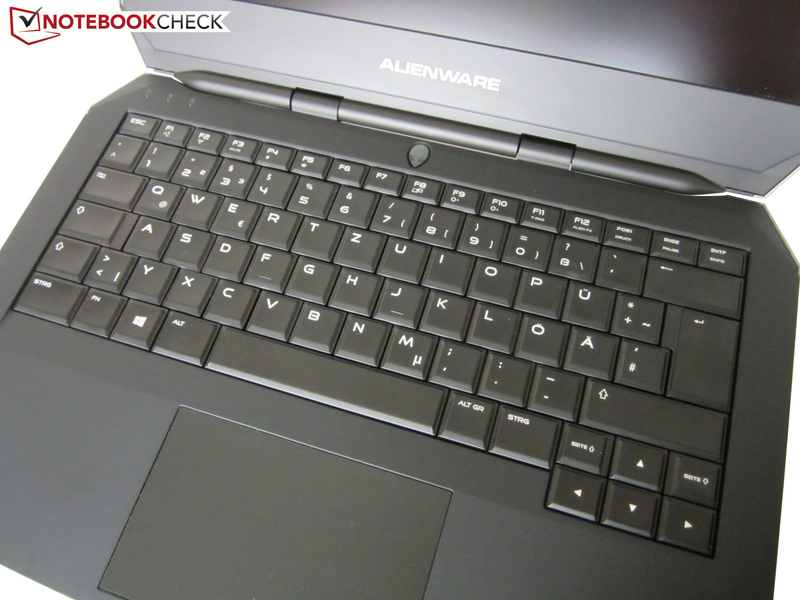 The overall score shows that the Alienware 13 is roughly 10% slower in the Fire Strike test. The GeForce GTX 860M cannot use its full potential in the Unigine Heaven 3.0 benchmark (1920x1080, High, Tessellation normal), either. 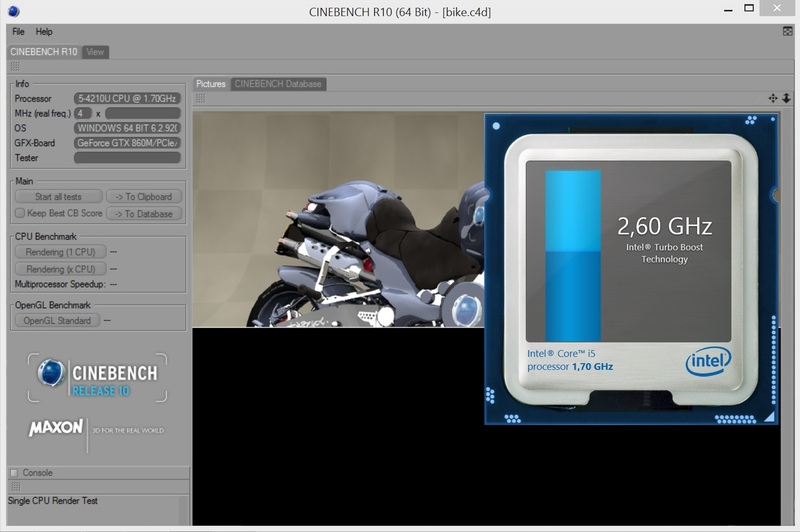 The result of 44.4 fps is similar to the DDR3 version of the GTX 850M. We will analyze the performance deficit in games later. 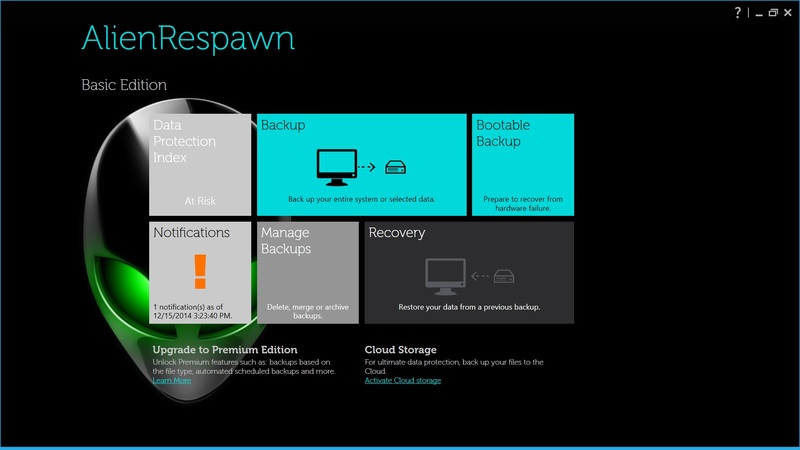 Because of the limited space, the Alienware 13 can only accommodate one storage drive. The customer has the choice between a conventional hard drive (1,000 GB @5,400 rpm) and a Solid State Drive (M.2 interface). 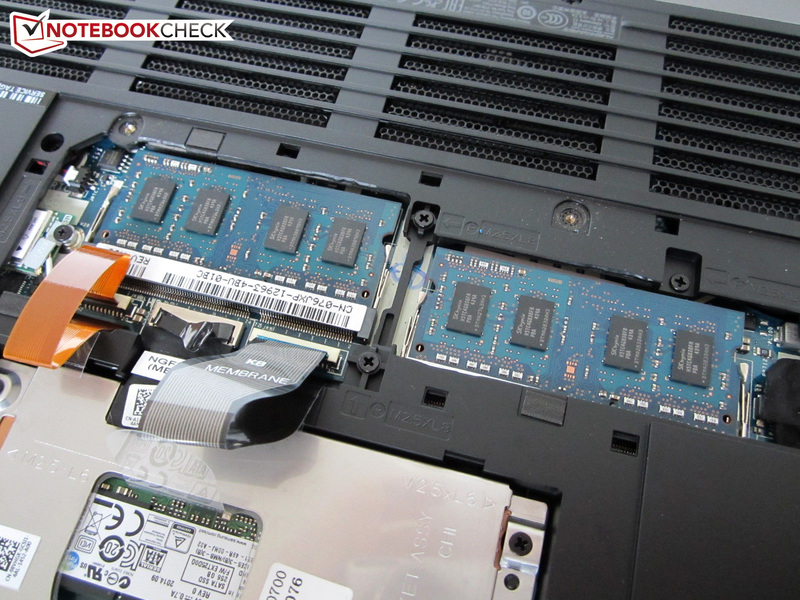 Our review unit is equipped with the PM851, a 256 GB SSD from Samsung. 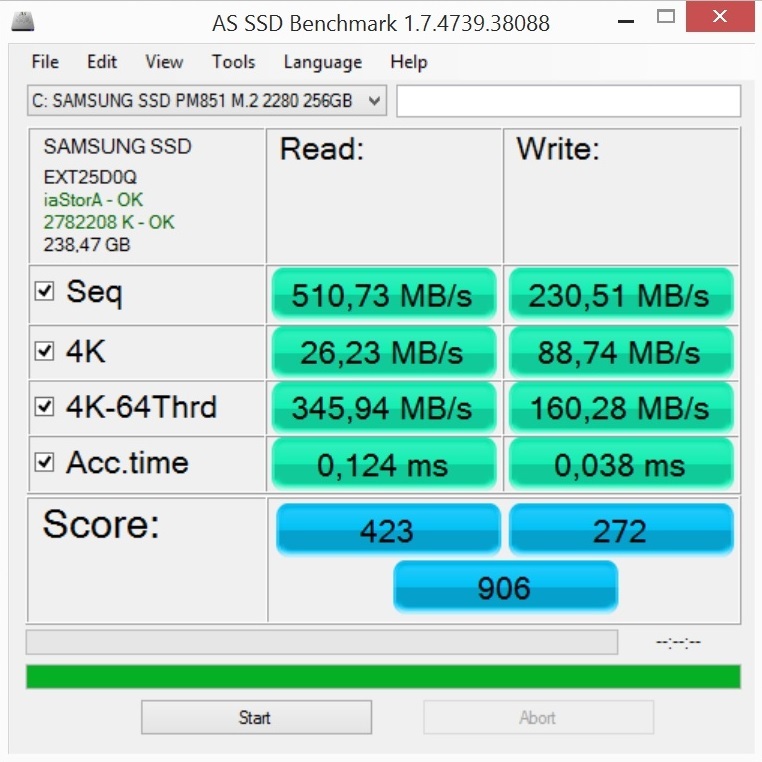 The results in the AS SSD benchmark are pretty average. 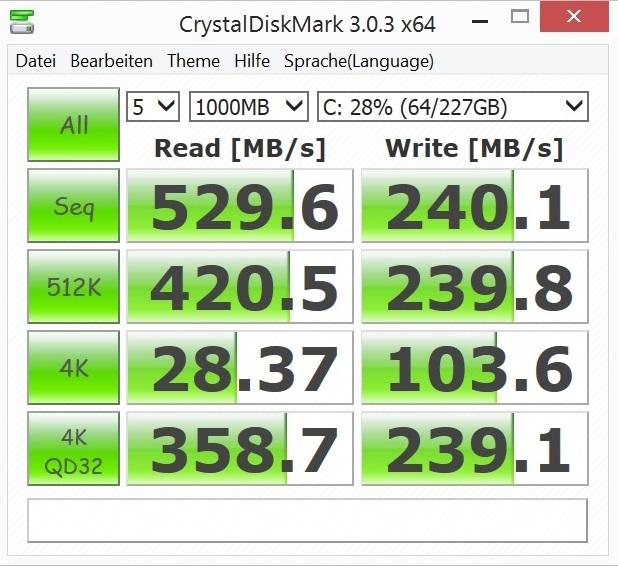 511 MB/s for sequential reads is pretty convincing, but 231 MB/s for sequential writes is not really good compared to other SSDs. The Micron M600 in the Schenker XMG P505 PRO, for example, managed roughly twice that. The difference is not as big with smaller files. The AS SSD benchmark determined an access time of 0.124 (read) and 0.038 ms (write), respectively. The comparatively weak dual-core also affects the system performance: 4,877 points in PCMark 7 is more comparable to office and all-round devices than real gaming notebooks. 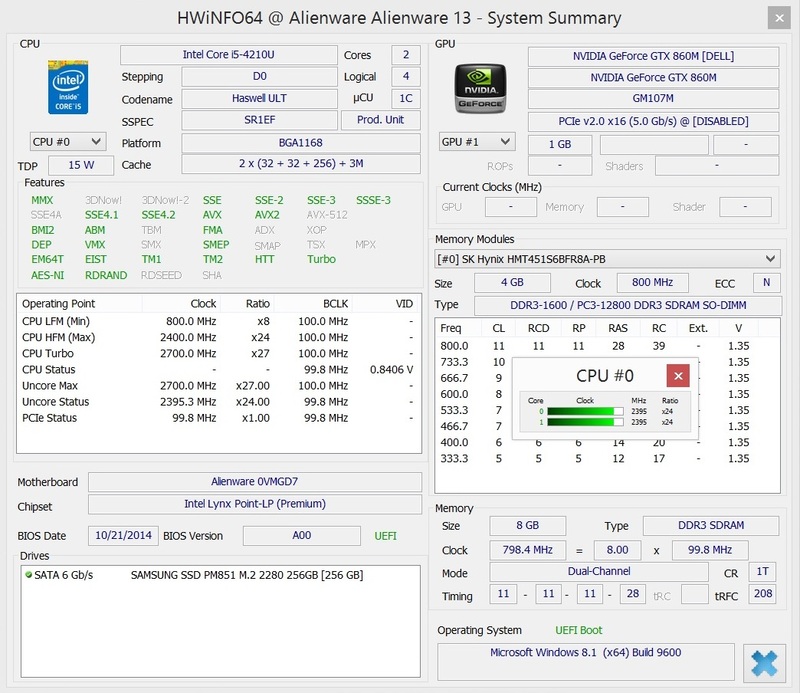 One of the biggest issues of the Alienware 13 is the mediocre gaming performance. Yes, there are some titles where the 15 Watts CPU is sufficient (Shadow of Mordor, Alien Isolation, The Evil Within), but the performance of other games suffers significantly. Besides The Crew and Call of Duty Advanced Warfare, Civilization Beyond Earth could be more than 10% faster in high settings (1920x1080 pixels) as well, according to our table. 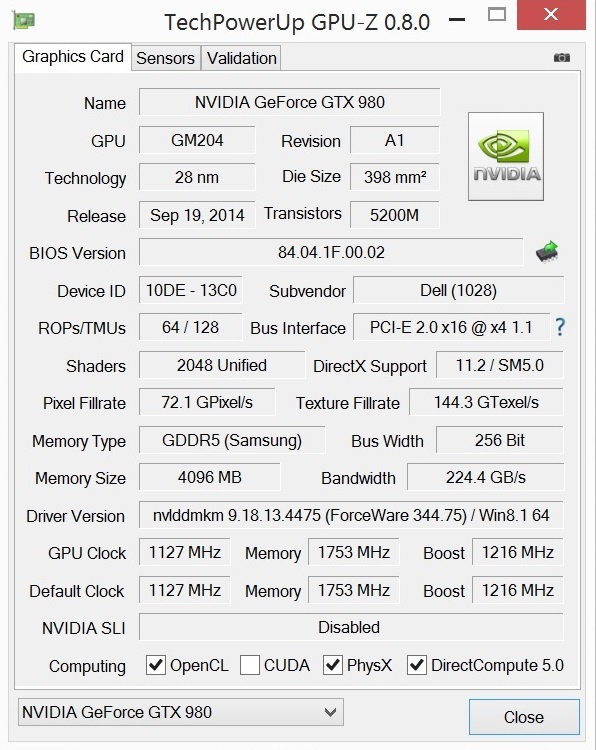 GTX 860M notebooks with a quad-core processor even have an advantage of more than 50 % in FIFA 15 and The Sims 4. 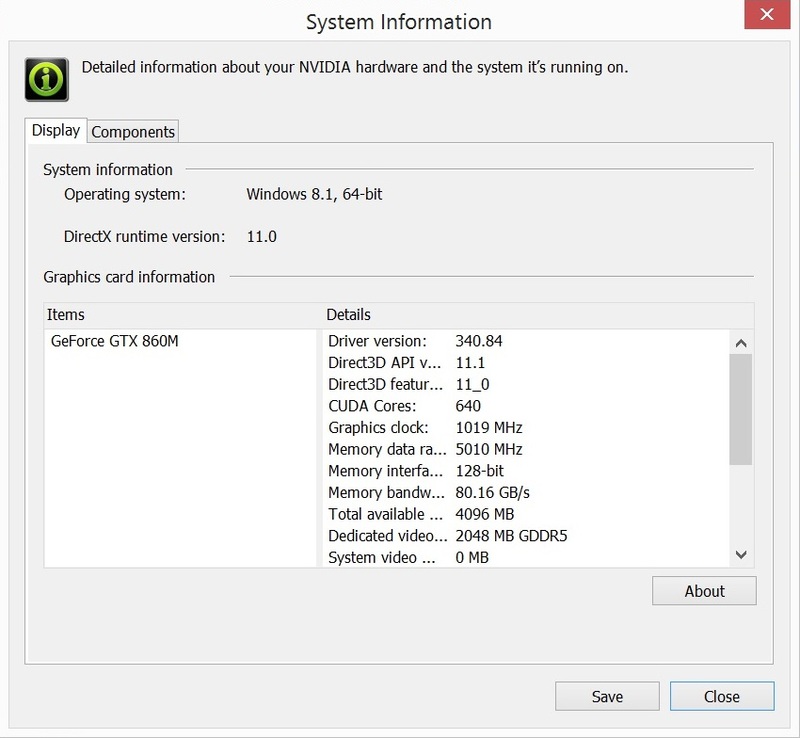 The results are often closer to a GeForce GTX 850M, and the system is sometimes beaten by a GT 750M notebook with low settings. As a result, we recommend that Dell replaces the Core i5-4210U with a 37 Watts dual-core or a quad-core. In this configuration, the Alienware 13 is only partially suited for ambitious gamers. 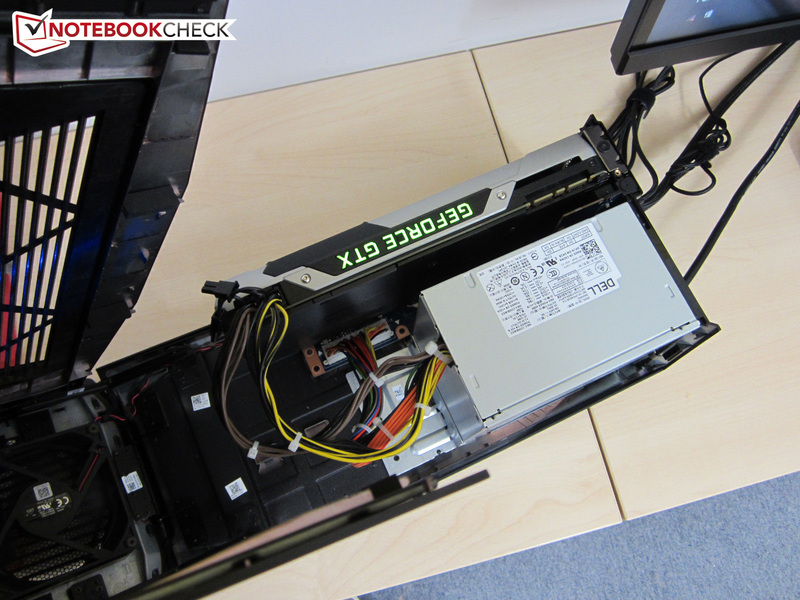 Our verdict was similar for the MSI GX60/GX70, which suffered from the weak AMD CPU. 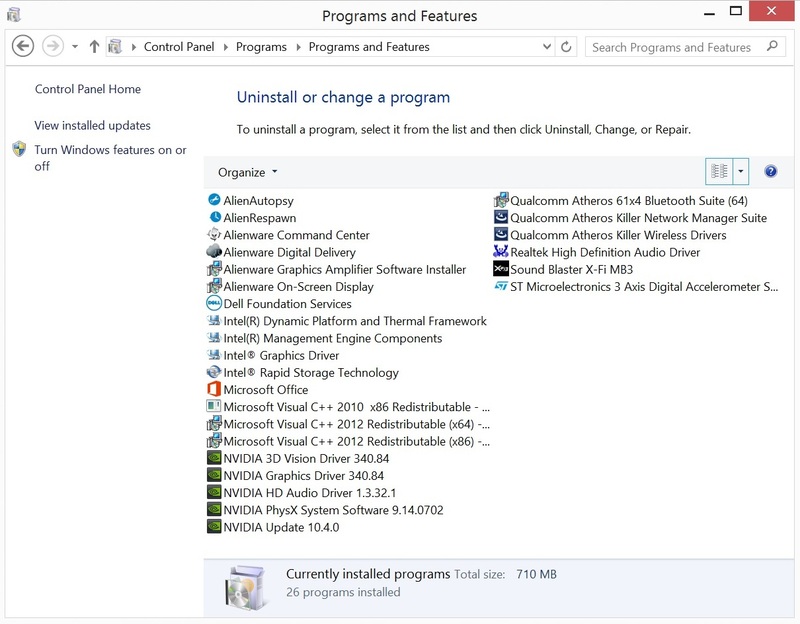 By the way, you should update the GPU driver to avoid problems with brand-new games. The preloaded ForceWare 340.84 of our review unit is already a bit outdated. The Graphics Amplifier is an external box with the dimensions 39.5 x 16.5 x 16 centimeters. 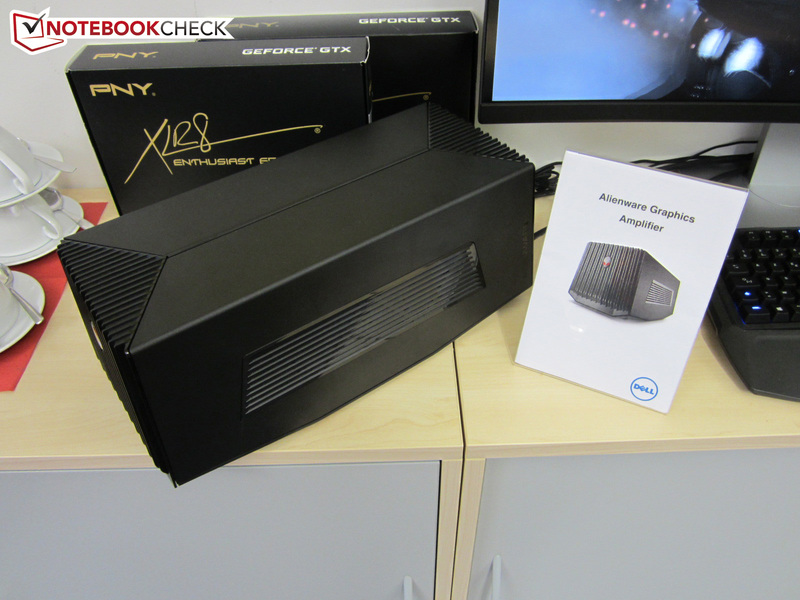 We already had a closer look at this box at a press event (see pictures), and it is designed for desktop graphics cards with a higher performance than the GTX 860M. Besides the dimensions, the weight is pretty lush as well: The box weighs a hefty 3,530 grams, which means it is 80% heavier than the notebook itself. 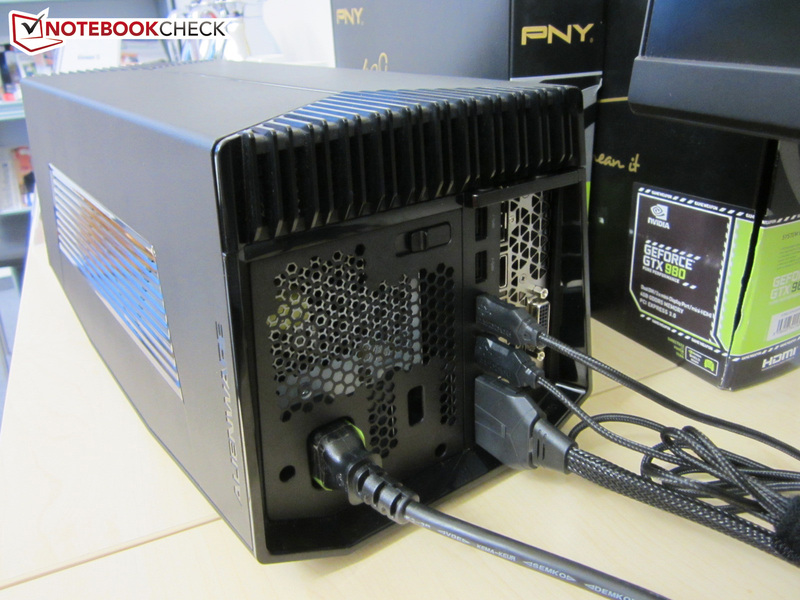 It includes a 460 Watts power adaptor, which is even sufficient for the most powerful desktop GPUs. The Graphics Amplifier is attached with a proprietary cable, which – contrary to modern motherboards – does not use a PCIe x16 interface, but only PCIe x4. This means very fast chips can lose about 10% of their performance. The installation of the Graphics Amplifier is very easy: After you opened the case and put the graphics card in the according slot, you just have to attach the power connectors. The Amplifier has two 8 pole connectors (each 6+2), so you can even use high performance models. 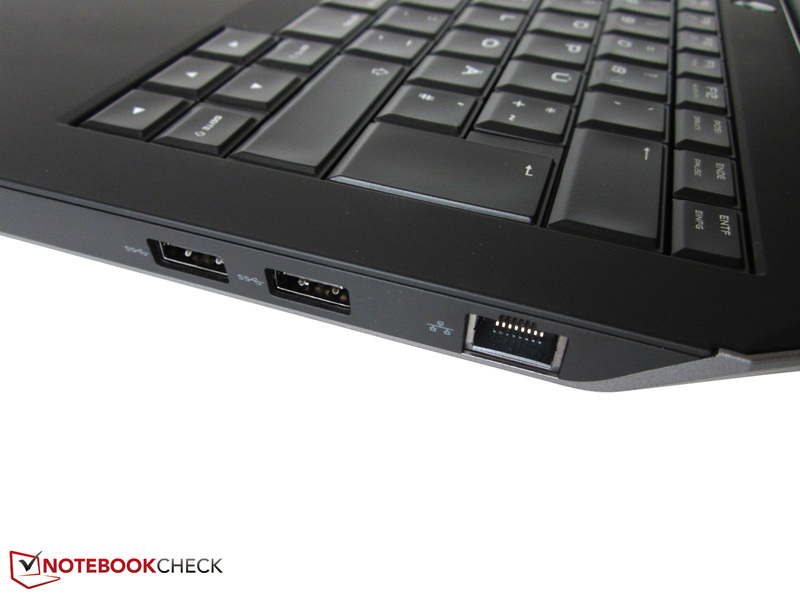 In addition, there are also four USB 3.0 ports. This means you can attach a lot of peripherals and many displays at the video ports of the graphics card. The Graphics Amplifier is shipped with a quick-start guide and two cables (power + data). Just as simple as the installation of the GPU is the commissioning: Attach the cable, boot the system and probably install a new driver – that's basically it. The deactivation is similarly simple in our opinion: If you don't need the Graphics Amplifier you can just use the key combination Fn + F1. Dell also deserves praise for the fact that Optimus is always available – it does not matter if you use the GeForce GTX 860M or the GPU in the Amplifier. One issue was the noise development. Even though the tested GeForce GTX 980 is one of the quietest high-end products from the last couple of years, the Amplifier was always clearly audible on the desk, both while idling and with 3D applications. We definitely miss some kind of fan control. However, the main problem was the performance. Despite the maximum clocks (1,250 MHz @core, 3,500 MHz @VRAM), the GeForce GTX 980 could not really use its full potential. 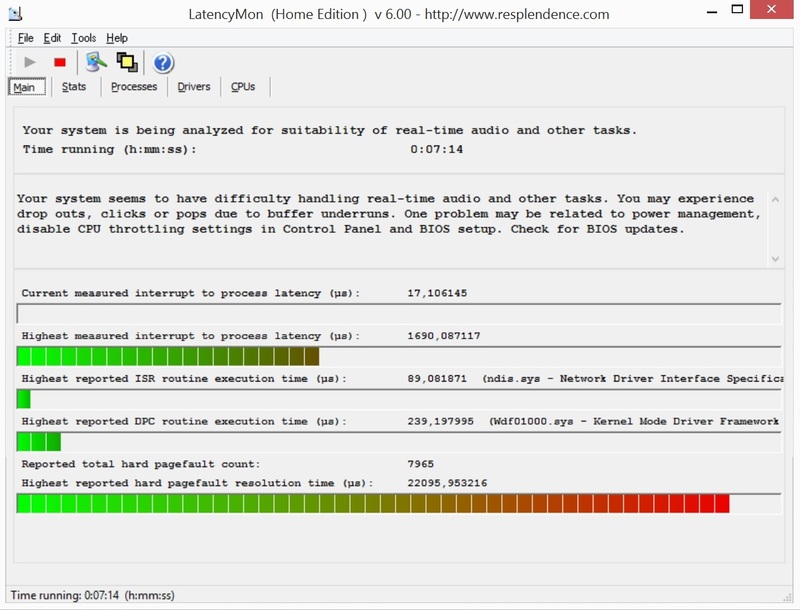 As expected, there is a massive limitation by the notebook CPU. The Graphics Amplifier only managed an overall score of 6,453 points in the 3DMark 13 Fire Strike test. Our desktop system with a Core i7-3770K (roughly comparable to the Core i7-4910MQ) was 62% faster, and +38% in the Unigine Heaven 3.0 benchmark (150.2 vs. 109.1 fps) is a pretty big difference as well. The difference is sometimes even bigger when you play games. While Alien Isolation, Assassin's Creed Unity and Call of Duty Advanced Warfare were "only" 26 up to 48% faster on the desktop PC (ultra preset), we were able to measure a difference of 83 and 99% for GRID Autosport and Far Cry 4, respectively. We measured the biggest difference in Watch Dogs, where the desktop PC was 165% faster. Watch Dogs did not run smoothly in general, so you can doubt the sense of the graphics box (at least in the case of the Alienware 13). We can eliminate the GPU driver as a cause for the mediocre performance. We used the current ForceWare 344.75 for our special tests. We did not perform tests for the noise, the power consumption and the temperatures because of time limitations. After a couple of minutes with 3D load, the GTX 980 reached almost 70 °C. 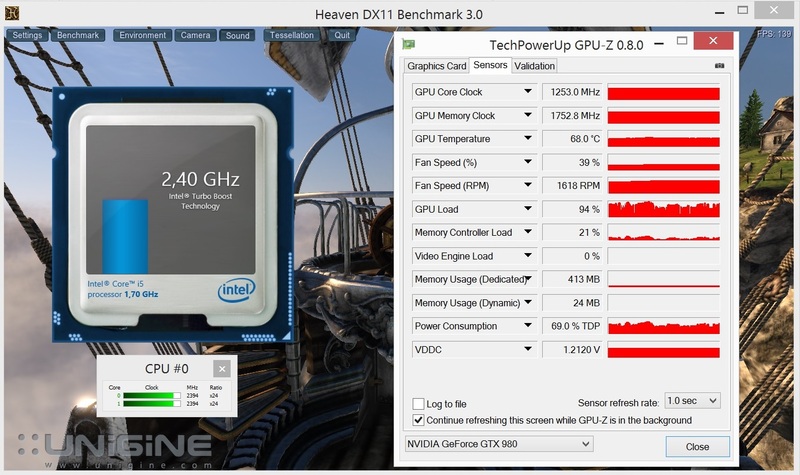 The CPU leveled off at 2.4 GHz with the deactivated GTX 860M. 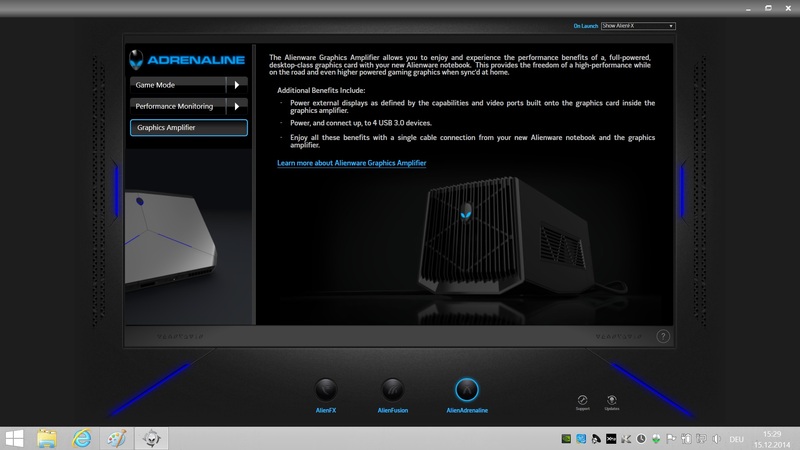 By the way, the Graphics Amplifier does not change the rating of the Alienware 13. 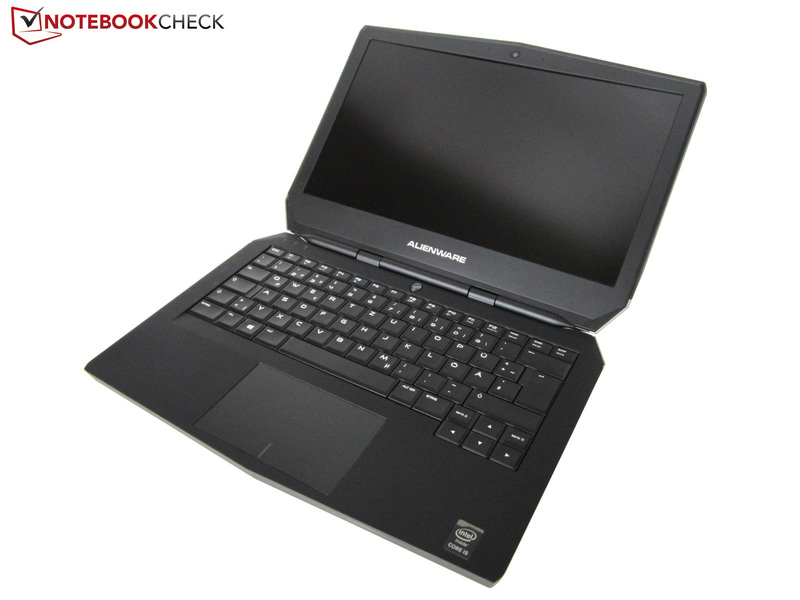 To come to the point: Despite the compact construction, the Alienware does not get louder or warmer than other 13 or 14-inch gaming notebooks. We were surprised by the idle operation in particular, where the device is completely silent, at least if you use a configuration with an SSD. The fans only get audible after longer periods of load. 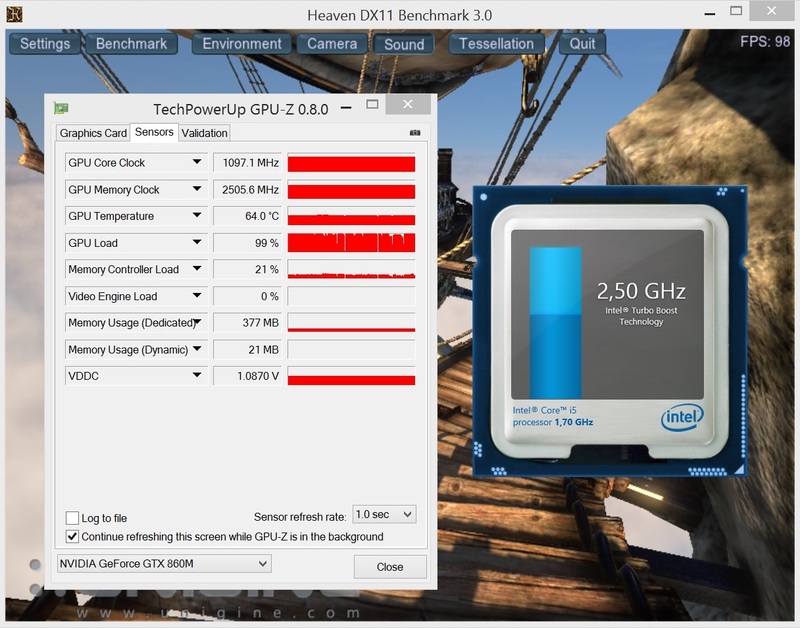 37.6 dB(A) in the first scene of 3DMark06 is more than acceptable, although the cooling solution often gets much louder during gaming and the fan noise is not as convenient compared to bigger notebooks. 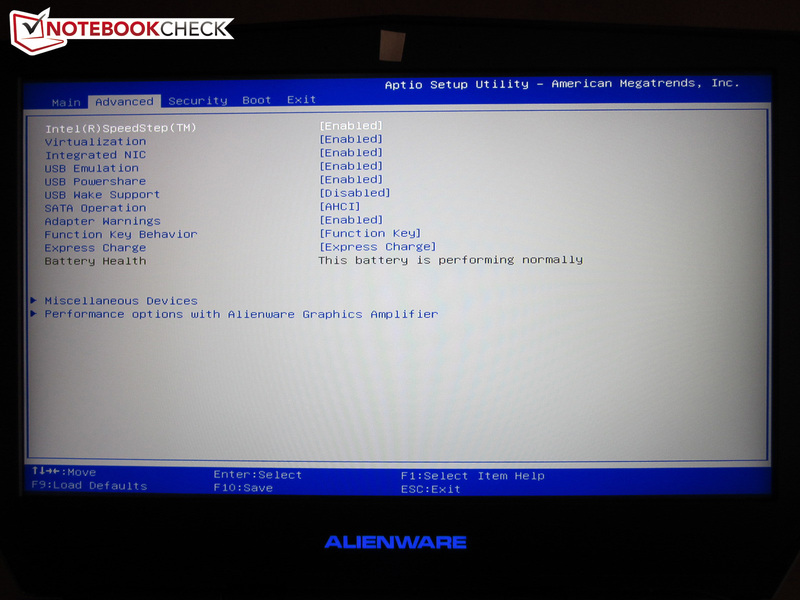 We have to criticize the maximum system noise of the Alienware. Almost 51 dB(A) under maximum load would be annoying for longer periods. Unfortunately, the fan control does not seem to work correctly at the moment. The fan did not reduce its speed after our stress test; we had to restart the notebook. Still, the rating for this section is pretty high since the cooling solution otherwise works pretty seamlessly. The temperature development does not have to hide behind the rivals, either. Thanks to the thicker construction and the weaker CPU, the chassis is cooler than the 14-inch device from Gigabyte. While the base unit of the P34G v2 reached around 42 °C (top) and 46 °C (bottom) in the stress test, we could only measure 37 °C and 41 °C for the Alienware 13. Still, this does not mean you should play with the notebook on your lap. The rear area can reach up to 60 °C (up to 59 °C @Gigabyte P34G v2) in extreme scenarios. 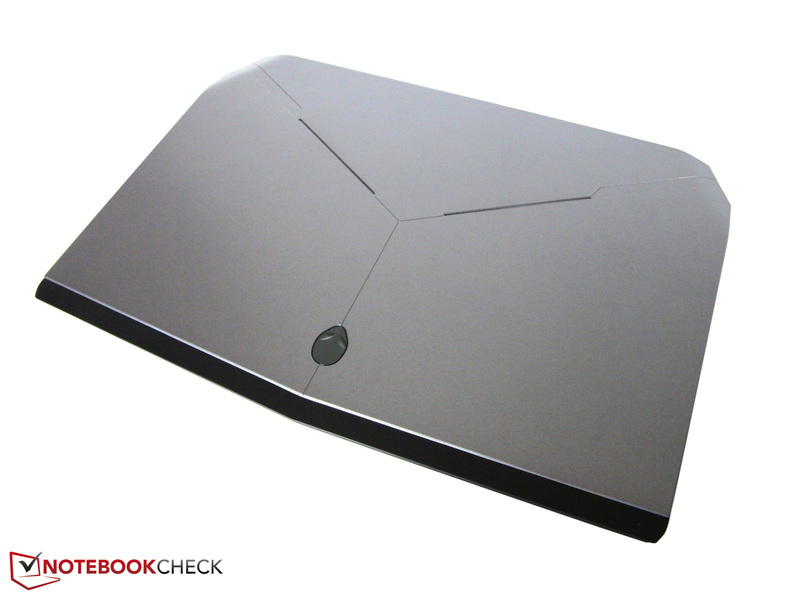 The Alienware 14 did not get quite as hot in the stress test, but the new sibling is cooler around the palm rest. Instead of 38 °C it just warms up to a more convenient 28 °C. 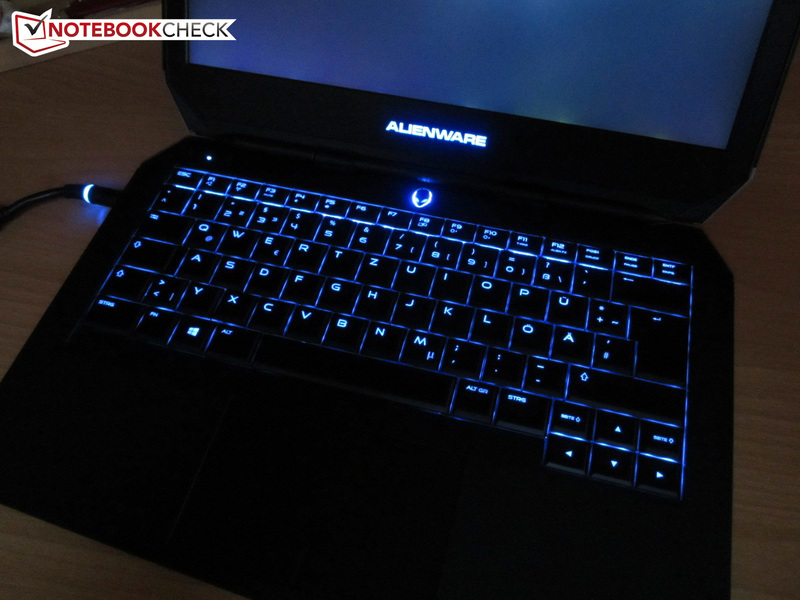 The Alienware 13 is cooler with light workloads in general. 27 °C on average after an idle period of two hours is definitely a good result. 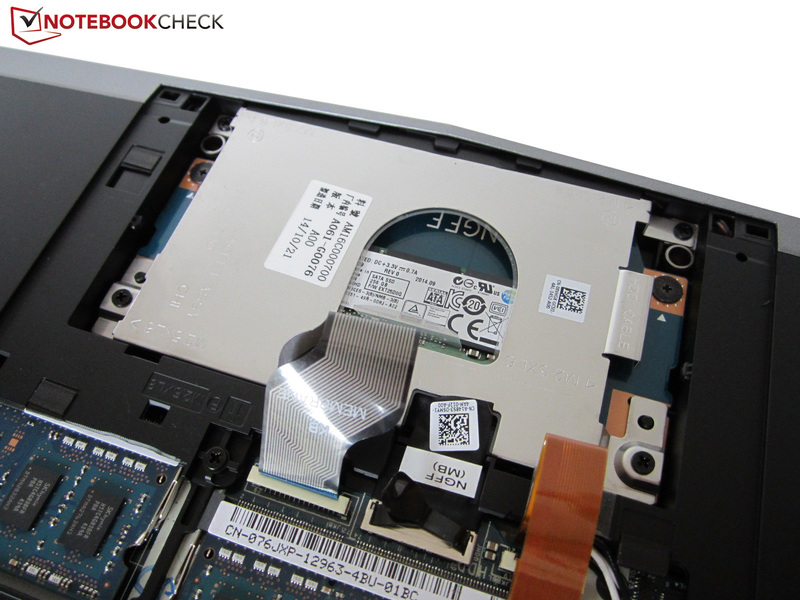 Our measurement device showed around 36 °C for the Alienware 14, while the surfaces of the Gigabyte P34G v2 warmed up to around 38 °C after the idle test. We liked the situation inside the case in particular: Up to 82 °C for the GPU and up to 78 °C for the CPU suggest that the cooling solution could handle a more powerful processor. Similar to the Alienware 17 and Alienware 18, Dell equips its gaming dwarf with a sound system that was certified by the audio experts from Klipsch. The stereo speakers are located at the front area of the sides. The quality is pretty decent when you consider the size of the notebook. 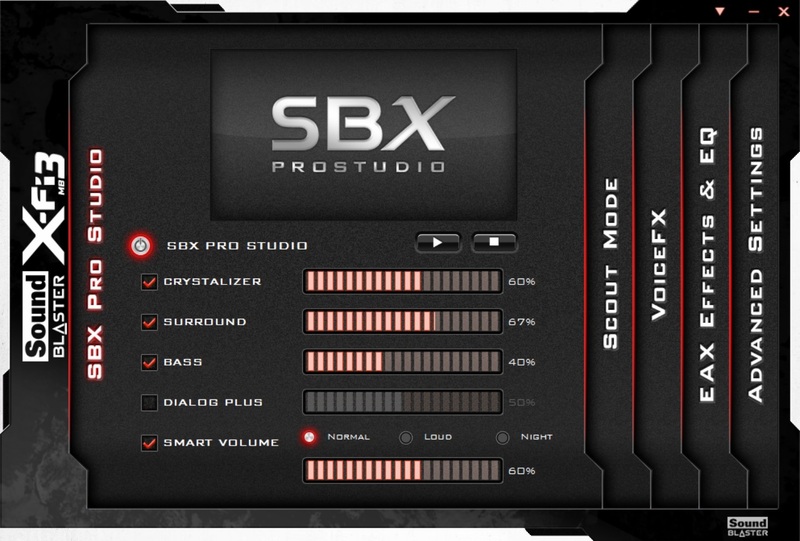 The sound tends to be unclean and tinny as soon as the volume reaches 50%, but the 2.0 combination has no problems with a moderate volume and the activated SBX Pro Studio technology. If you want a better sound experience you will have to use external speakers or a headset. Music in particular shows the limits of the Alienware 13. 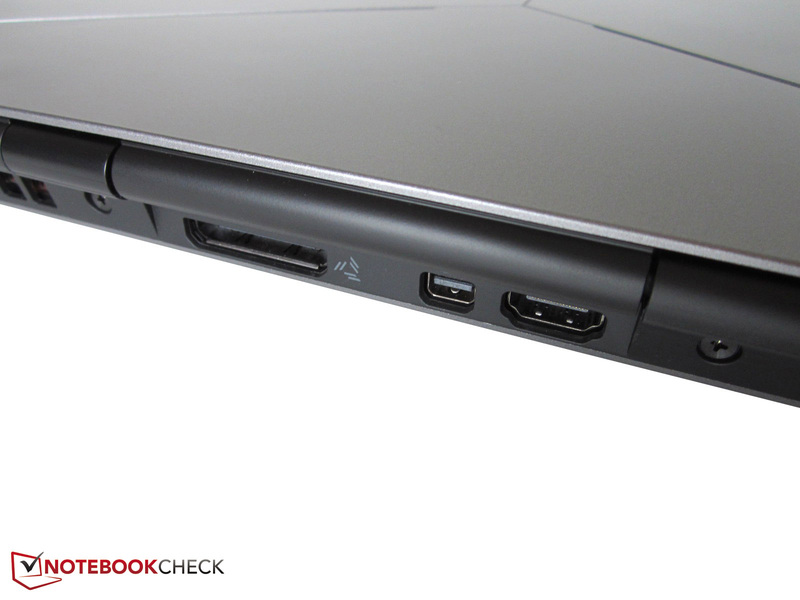 One of the biggest advantages of the Alienware 13 is the low power consumption. 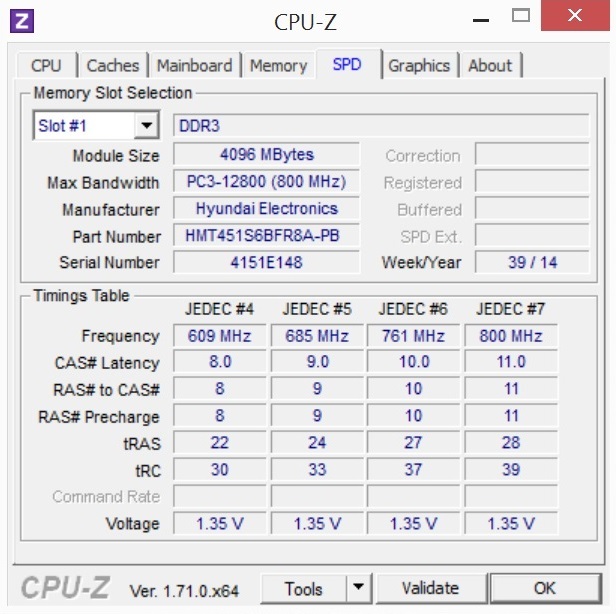 An idle consumption of 5.1-11.2 Watts is much lower compared to other gaming notebooks. The Gigabyte P34G v2 (4700HQ, GTX 860M) consumed 84% more in our review, and the Alienware 14 (4700MQ, GTX 765M) even consumed three times more power. The 13-inch notebook is also pretty frugal under load: 52 Watts (average 3DMark06) and 93 Watts (stress test) are no problem for the power adaptor. The Alienware 14 and the Gigabyte P34G v2 pulled up to 140 Watts from the socket. Thanks to the respectable consumption values, the Alienware 13 manages enormous battery runtimes. Even though the 4-cell battery with 52 Wh is not one of the biggest modules on the market, you can still realize longer road trips. Almost 12 hours idling (minimum brightness) is just as remarkable as 5 hours of web browsing and 5.5 hours of HD video playback (medium luminance). The battery should last around two hours when you play games with the maximum brightness. 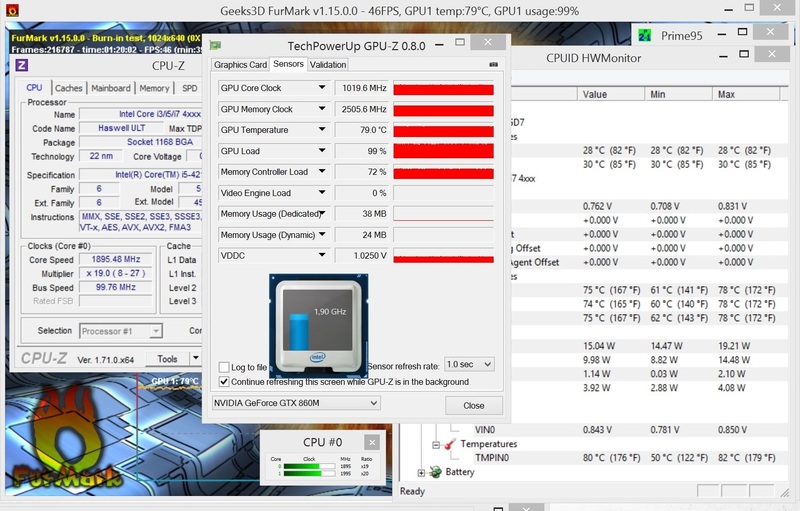 Great: According to 3DMark 13, the performance is constant on battery power. 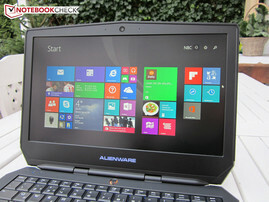 Apart from the processor, which is debatable, Dell offers an excellent 13-inch notebook with the Alienware 13. Besides the build quality and the nice design the display in particular is a highlight. 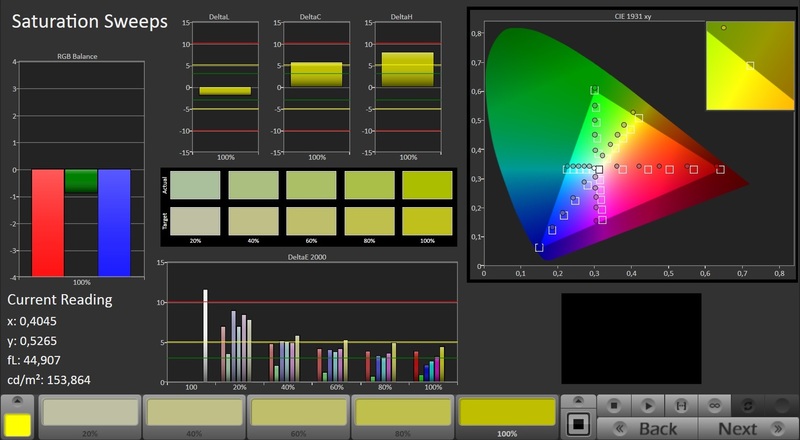 It is rare that we review such a high-contrast IPS panel with wide viewing angles. 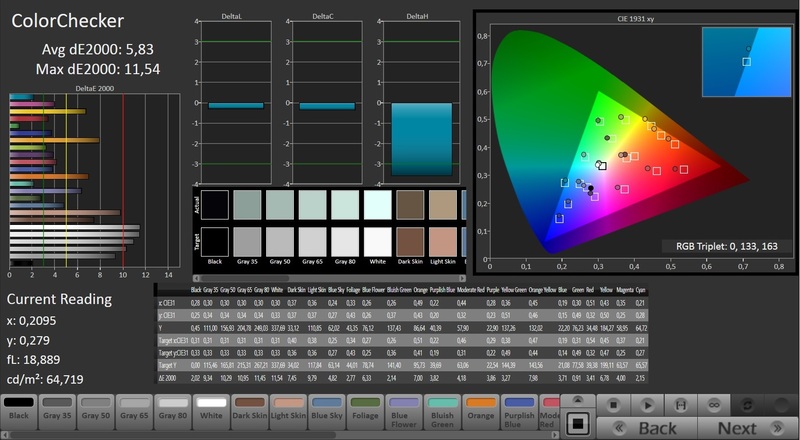 Color accuracy, black value and luminance are also superior to the majority of rivals. 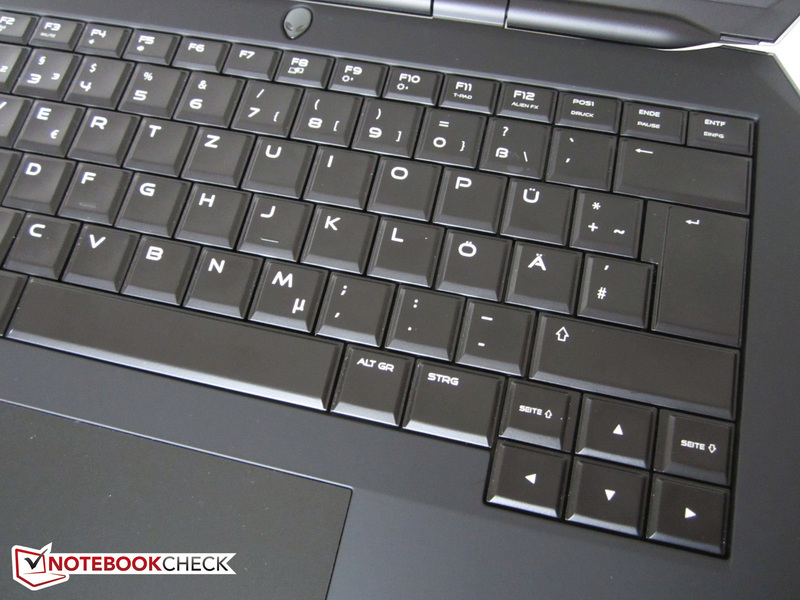 Another convincing feature is the illuminated keyboard that leaves a great overall impression. 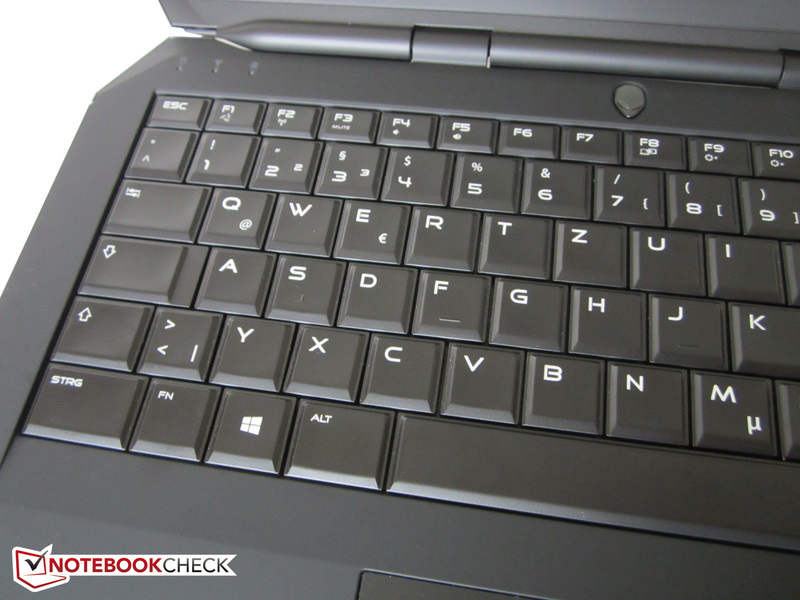 You should not forget the battery runtimes, either: Hardly any gaming notebook manages more than 10 hours. However, the mobility is possible because of the weak CPU. 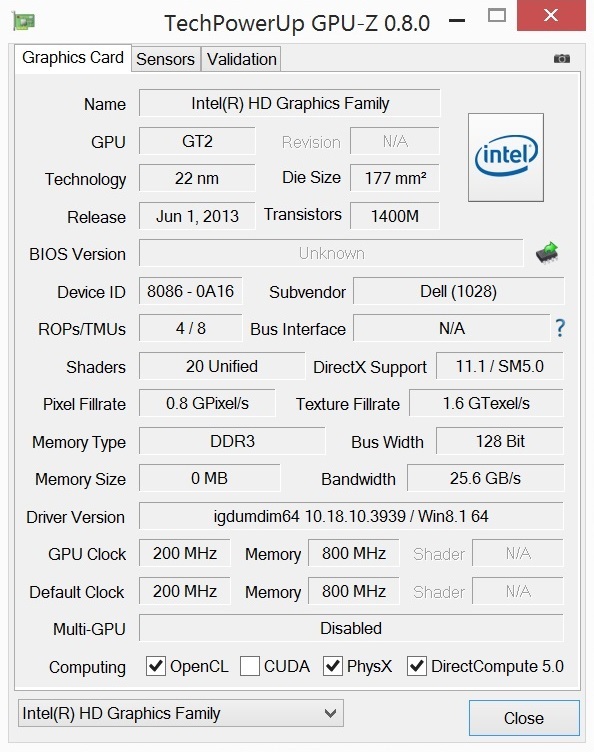 The Core i5-4210U is a limiting factor in many games, so the GTX 860M cannot utilize its full performance. 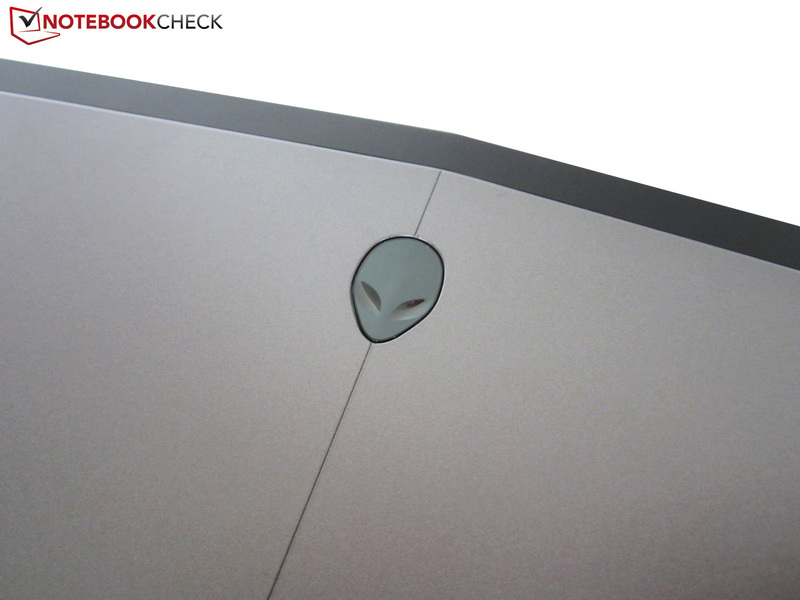 Therefore, we cannot say that the Alienware 13 is really future-proof. Upcoming titles might not run smoothly – it does not matter what settings you select. This is also the reason that Dell could have waived the Graphics Amplifier. The external graphics box would only make sense with a more powerful dual-core processor or a quad-core. 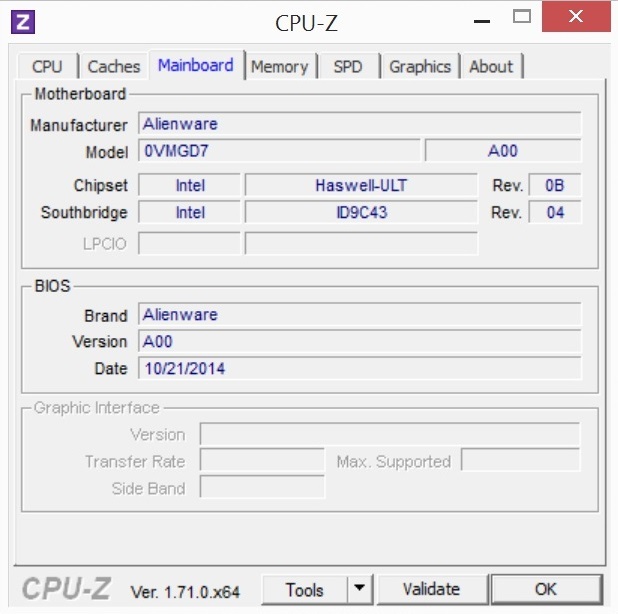 Desktop chips in particular suffer from the 15 Watts CPU. That the final rating is just 82% is primarily caused by the CPU. 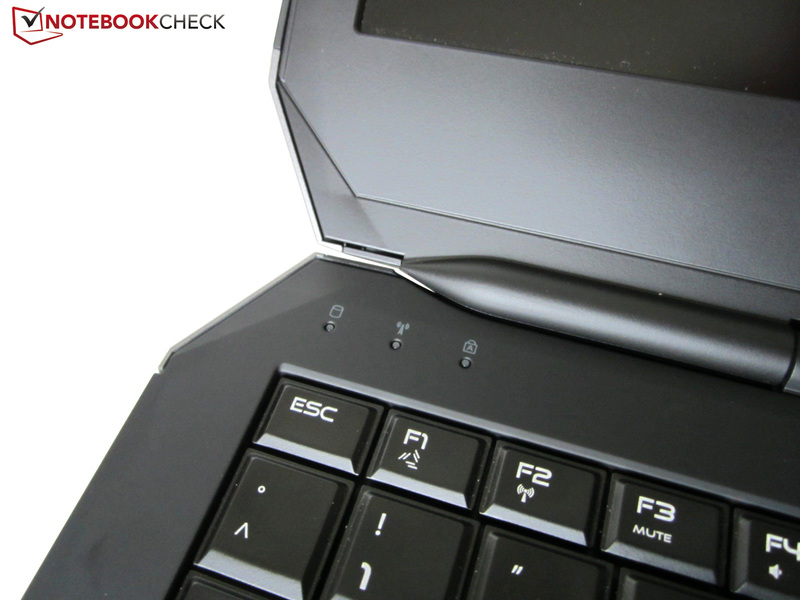 The rough touchpad and smaller issues with the sound affect the rating as well. 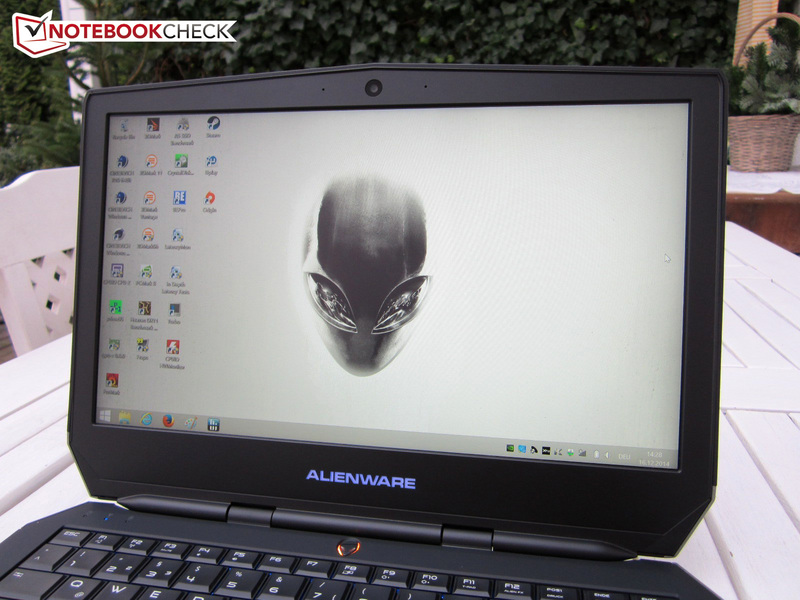 Still, the Alienware 13 is a good solution if you are looking for a compact gaming notebook. 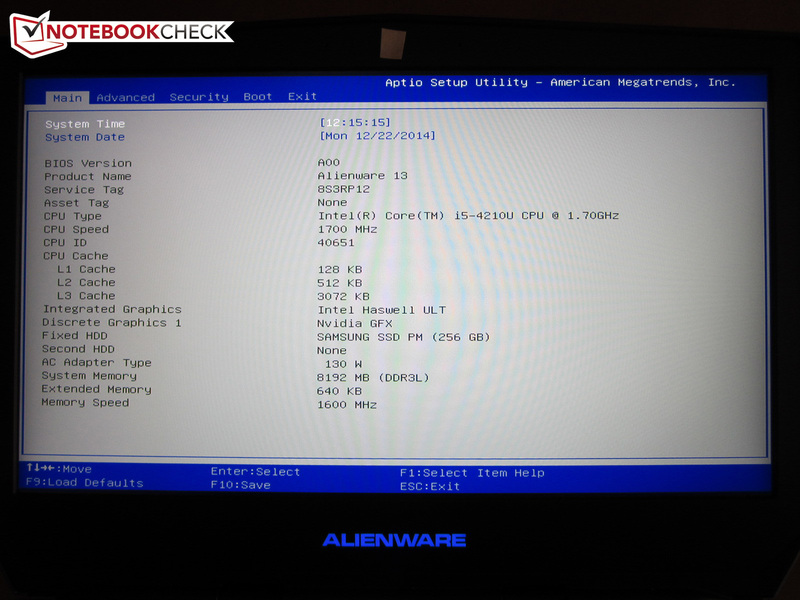 High-end laptops with 13 or 14-inches are still rare. 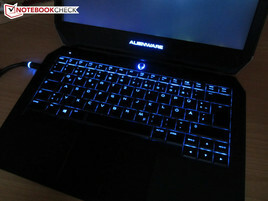 Alienware 13. Test device courtesy of Dell Germany. A high-end GPU in a 13-inch chassis? 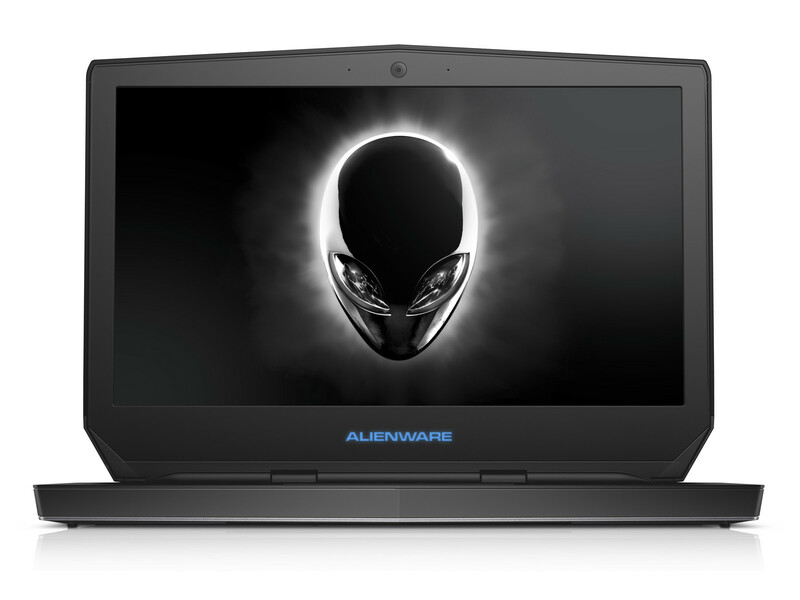 This is the Alienware 13. The notebook has a height of around 3 centimeters. The maximum opening angle is 145 degrees. A maintenance cover is integrated as well. You can only find one hard drive bay. 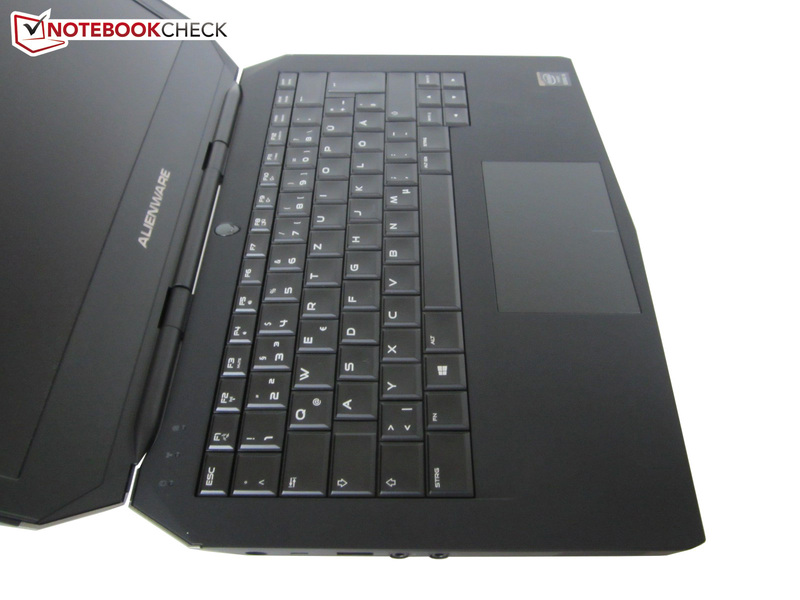 Our review unit is equipped with an M.2 Solid State Drive. Every memory slot supports up to 8 GB. The manufacturer integrates a webcam with two megapixels. Many chassis elements can be illuminated. Above the keyboard are three status LEDs. No chiclet design, but crowded keys. The arrow keys are slightly shifted. The mouse replacement is a ClickPad. You can attach the Amplifier and two displays at the back. A few more ports would have been nice. The communication is handled by products from Killer. The speakers are hidden at the front area of the sides. The power adaptor is specified with 130 Watts. The IPS panel is superior to the TN competition. A slightly smoother touchpad would be nice. The battery runtimes and the thermals seem to be more important for Dell than the performance. 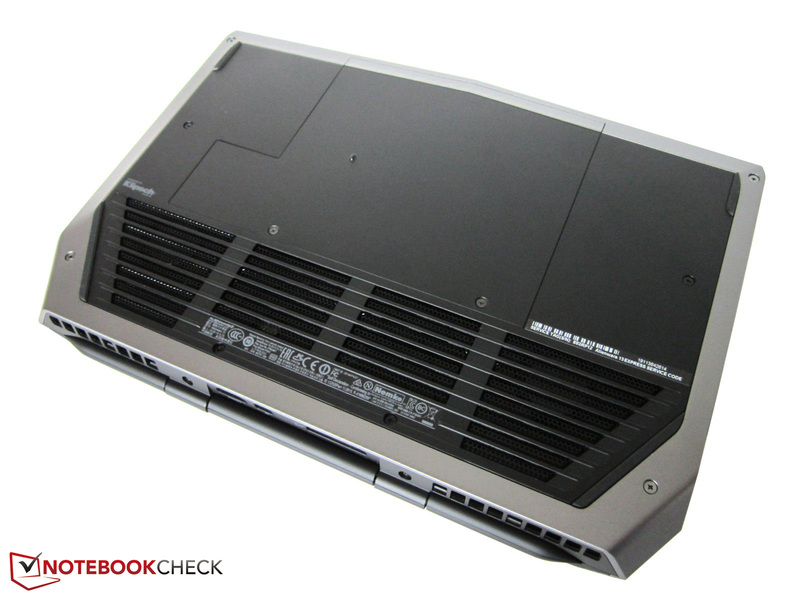 13 or 14-inch gaming notebooks like the Schenker XMG P304, Gigabyte P34G v2 or MSI GE40.